The invention belongs to the technical field of biological medicine, and particularly relates to a preparing method and medical application of optimized plant source recombination humanized bevacizumab. Heavy-chain and light-chain fusion protein of the recombinant antibody bevacizumab is expressed in plants, heavy chain and light chain are expressed in an proportion appropriate to 1:1 by adding 2A sequence to fusion protein, the proportion promotes assembly of a complete antibody obviously, and results show that the yield of antibodies expressed with the system is high. Meanwhile, due to the fact that a stable tetramer structure is formed through equal-proportion assembly of the heavy chain and light chain of the recombinant antibody, the number of unassembled polypeptides easy to degrade is reduced, and then pure and consistent monoclonal antibodies are obtained. The bevacizumab developed with a new method is applied to medicine to be used for treating breast cancer, lung cancer, spongioblastoma, kidney cancer, cervix uterus cancer, ovarian cancer, colon cancer and rectal cancer. 本发明属于生物医药技术领域，具体涉及一种优化的植物源重组人源化贝伐单克隆抗体的制备方法及医药应用。  The present invention belongs to the field of biotechnology medicine, in particular to a method of optimizing the preparation of recombinant plant-derived humanized monoclonal antibody bevacizumab, and pharmaceutical applications. 贝伐单克隆抗体，简称（贝伐单抗），其商品名为阿瓦斯汀(Avastin)，是重组的人源化单克隆抗体，为罗氏公司的癌症治疗畅销药物(http://www.avastin. com/patient)。 People  bevacizumab, a monoclonal antibody, referred to as (bevacizumab), the trade name Avastin (Avastin), is a recombinant humanized monoclonal antibody, for the treatment of Roche's best-selling cancer drugs (http: / /www.avastin. com / patient). 2004年2月26日获得Π )Α的批准，是美国第一个获得批准上市的抑制肿瘤血管生成的药，其2009年的销售额达59亿美元。 Approved February 26, 2004 to obtain Π) Α is the inhibition of tumor angiogenesis drug approved first US listing of its 2009 sales of $ 5.9 billion. 贝伐单抗是通过中国仓鼠卵巢细胞表达系统生产的，分子量大约为149,000道尔顿。 Bevacizumab is by Chinese hamster ovary cell expression system for the production of a molecular weight of about 149,000 Daltons. 贝伐单抗是一种阻碍血管生成的药物，通过抑制血管内皮生长因子的作用阻断对肿瘤的血液供应，抑制肿瘤在体内扩散，增强化疗效果。 Bevacizumab is a hindrance angiogenesis drugs, growth factors through the inhibition of endothelial block blood supply to tumors, to inhibit tumor proliferation in vivo, to enhance the effect of chemotherapy. 在批准用于治疗乳腺癌之前，这种药物还被美国药管局批准用于治疗肺癌、恶性胶质瘤、肾癌、子宫颈癌、卵巢癌、结肠癌和直肠癌，并在欧洲获准用于治疗乳腺癌。 Before approved for the treatment of breast cancer, the drug has also been approved by the US FDA for the treatment of lung cancer, glioblastoma, renal cancer, cervical cancer, ovarian cancer, colon cancer and colorectal cancer, and approved for use in Europe in the treatment of breast cancer. 贝伐单抗的作用机制为:血管生成是新血管形成的过程(Wanget al. ,2004)。 The mechanism of action of bevacizumab is: Angiogenesis is the process of new blood vessel formation (Wanget al, 2004.). 肿瘤需建立独立的血供以使其直径超过l-2mm，因此血管生成是恶性肿瘤生长中的一个重要过程。 Tumor need to establish an independent blood supply such that it exceeds the diameter of l-2mm, and therefore is an important process in angiogenesis, growth of malignant tumors. VEGF为肿瘤血管生成的关键调控者，并且是唯一一种表达于整个肿瘤生命周期的血管生成因子。 VEGF is a key regulator of angiogenesis and vascular only an expression of the entire life cycle of tumor generation factor. VEGF的持续表达，以及VEGF和内皮细胞的遗传学稳定性(基于临床前研究的观察结果），可使"直接并且持续靶向于VEGF成为一种重要的抗肿瘤策略(Presta et al ·，1997 ;Ferrara et al ·，2005)。 Sustained expression of VEGF, VEGF and genetic stability and endothelial cells (based on the observation results of preclinical studies), can "continuously and directly targeting the VEGF become an important antitumor strategy (Presta et al ·, 1997 ; Ferrara et al ·, 2005). 随着分子生物学的发展，80年代初，科学家们开始利用基因工程技术来研制抗体， 并逐渐形成了一门新型的跨学科技术------抗体生物技术(Antibody biotechnology)。  With the development of molecular biology in the early 1980s, scientists began using genetic engineering techniques to develop antibodies, and gradually formed a new cross-disciplinary technical ------ Biotechnology antibody (Antibody biotechnology) . 它是以DNA重组技术为手段，将动物淋巴细胞所产生的抗体基因人为地改造后转入真核或原核细胞中进行表达，产生具有免疫活性的抗体或其功能片断。 It is based on recombinant DNA technology as a means of transfer after artificially engineered antibody genes to animal lymphocytes generated prokaryotic or eukaryotic cells for expression, to produce the antibody or functional fragment having immunological activity. 1989年美国医学生物学家Hiatt等(Hiatt etal.，1989)从小鼠中克隆了抗体重链和轻链基因，并分别用农杆菌介导法转入烟草，通过有性杂交和筛选鉴定，在后代同一植株中表达出由重链和轻链组装的功能性抗体，抗体量可达烟草叶总蛋白的1.3%。 1989 American Medical Hiatt et biologist (Hiatt etal., 1989) was cloned from a mouse antibody heavy and light chain genes, respectively, and transferred into tobacco using Agrobacterium tumefaciens, by sexual hybridization screening, identification and, in progeny plants expressed by the same functional antibody heavy and light chains assembled antibodies of up to 1.3% of total tobacco leaf protein. 他的研究结果是人类利用异质细胞表达抗体的成功范例，打破了动植物物种之间的界限，引起了生物界的极大兴趣和高度重视。 His findings are the use of heterogeneous cells expressing human antibodies success stories, breaking the boundaries between plant and animal species, the biosphere caused great interest and attention. 从此， 分泌性抗体、完整抗体、嵌合抗体、Fab片段、scFv片段和双特异活性scFv片段等先后成功地在烟草、马铃薯、水稻、小麦或拟南芥的叶片、根、块茎和种子等器官中表达，表达水平通常占总可溶性蛋白的0.5%~2%(Barta et al.，1986;De Muynck et al.，2010;Desai et al.，2010;Xu et al.，2011;Huang and McDonald,2012)。 Since then, secreted antibodies, intact antibodies, chimeric antibodies, Fab fragments, scFv fragments and bispecific scFv fragments etc. has successfully active in tobacco, potato, rice, wheat, Arabidopsis leaves, roots, tubers and seeds or other organs expression, the expression level of 0.5% to 2% of the total soluble protein normally (Barta et al, 1986;. De Muynck et al, 2010;. Desai et al, 2010;. Xu et al, 2011;. Huang and McDonald, 2012). 1990年，During等（During et al.，1990)将抗体重链和轻链基因装入同一个表达载体盒，转入烟草后获得有抗原结合活性的抗体。 1990, During the like (During et al., 1990) The antibody heavy and light chain gene cassette insert into the same expression vector, then transferred to tobacco obtain antigen binding activity. 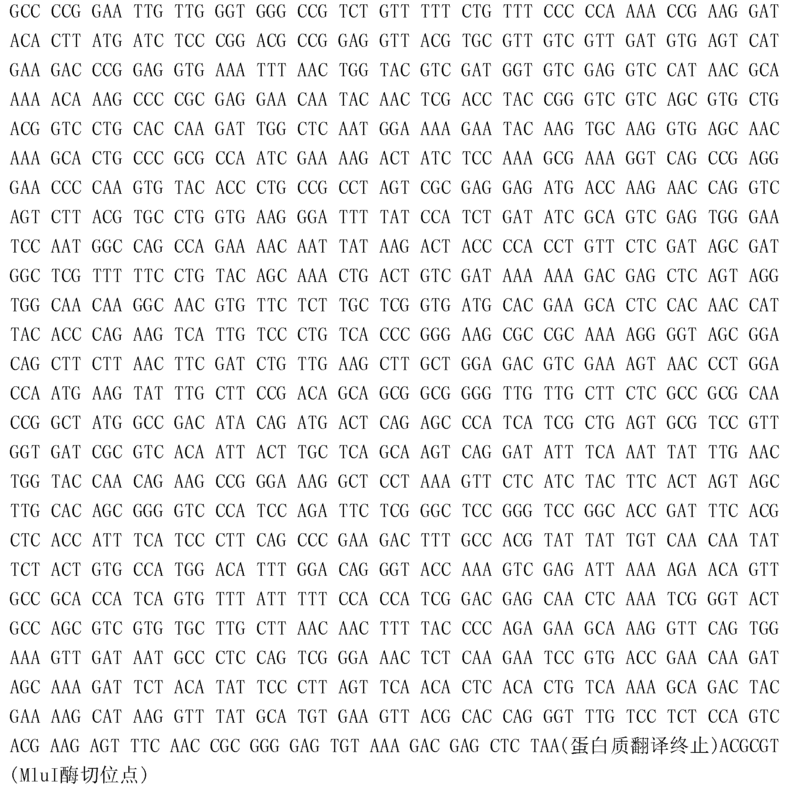 1991年Benvenuto(Benvenuto et al ·，1991)将一种神经肽单抗的VH基因插入植物表达载体，在烟草中获得表达，这种单域抗体具有抗原结合特性，表达量占可溶蛋白的1%。 1991 Benvenuto (Benvenuto et al ·, 1991) the VH gene of MAb neuropeptide inserted into plant expression vectors to obtain expression in tobacco, such single domain antibodies having antigen-binding characteristics, an expression amount of soluble protein %. 1992年，Owen等(Owen et al.，1992)构建成抗光敏色素的scFv基因，导入烟草后，scFv 基因在转基因植株中高水平表达。 In 1992, Owen et (Owen et al., 1992) to construct an anti-phytochrome scFv gene, the introduced tobacco, the scFv gene expressed at high levels in transgenic plants. De Wilde等(De Wilde et al.，1998)在拟南芥菜和烟草中表达了抗体IgGl的Fab片段，并证实两种植物表达出的抗体都具有抗原结合能力，但表达量不同。 De Wilde et (De Wilde et al., 1998) expression in Arabidopsis and tobacco of the Fab fragment of IgGl antibodies and antibody confirmed the expression of two plants having antigen-binding ability, but a different expression. Kathuria等(Kathuria et al.，2002)成功地在烟草中表达了抗HCG的全长抗体，抗体量可达烟草叶总蛋白的4% aRodriguez等(Rodriguez et al · ,2005)在烟草叶中瞬时表达了抗表皮生长因子(EGF2R)的重组抗体，并证实其可识别A431肿瘤细胞表面的EGF2R。 Kathuria, etc. (Kathuria et al., 2002) succeeded in expressing the full-length antibodies against HCG in tobacco, the amount of antibody up to 4% aRodriguez total tobacco leaf protein, etc. (Rodriguez et al ·, 2005) transiently in tobacco leaves expression of recombinant antibodies against epidermal growth factor (EGF2R) of which can be identified and confirmed EGF2R A431 tumor cell surface. 最近陈磊和于为常（陈磊and于为常，2015)通过密码子在水稻中成功表达了贝伐单抗(Bevacizumab)抗体，为通过植物生产抗癌抗体药物打下了基础。 Chen Lei and in recent normally (as in Chen Lei and Chang, 2015) by codon successfully expressed bevacizumab (Bevacizumab) antibody in rice, for the production of anti-cancer antibody drugs through plant foundation. 植物表达抗体研制包括以下程序：（1)克隆抗体基因；（2)构建抗体基因植物表达载体；（3)抗体基因导入植物细胞或获得遗传转化植物；（4)植物抗体的表达和纯化。  Plant expression of antibody development includes the following programs: (1) cloning antibody gene; (2) Construction of antibody gene plant expression vector; expression (4) plants antibody and; (3) an antibody gene into a plant cell or to obtain genetically transformed plant purification. 抗体重链和轻链可变区（VH和VL)、以及恒定区（Fc)基因片段都可通过PCR方法从分泌抗体的杂交瘤细胞或通过噬菌体抗体库中扩增得到。 Gene fragment of an antibody heavy and light chain variable region (VH and VL), and the constant region (Fc) antibody library by phage can be amplified or obtained from antibody-secreting hybridoma cells by PCR. 抗体基因在植物中表达需要加入植物表达启动子，CaMV35S是常用的组成性启动子，也可利用组织特异性启动子使抗体在特定器官中表达。 Antibody gene expression requires added plant expressible promoter in a plant, is commonly used in the CaMV35S constitutive promoter, or tissue specific promoter can be used to make an antibody expression in a particular organ. 如用来自蚕豆(Vicia faba)的LeB4和USP启动子表达的ScFv在烟草种子中特异积累。 As expressed in LeB4 and USP promoter from Vicia faba (Vicia faba) ScFv-specific accumulation in tobacco seeds. 抗体分泌到特定的细胞器对于抗体有效折叠和稳定是需要的。 Antibody is secreted into the organelle specific antibodies are effective for folding and stability is required. 在抗体基因前加上信号肽(可来源于植物、酵母、小鼠）对抗体在特定亚细胞组分中合成和积累是重要的。 Plus antibody before the signal peptide gene (may be derived from plant, yeast, mouse) antibody synthesis and accumulation are important in a particular subcellular fractions. 已有的研究表明scFv片段C端加上内质网滞留信号肽KDEL或KDEI，能够在细胞内获得较高水平的积累。 Previous studies showed that the scFv fragments together with the C-terminal endoplasmic reticulum retention signal KDEL peptide or KDEI, possible to obtain higher levels of accumulation in the cell. 一些全抗体或Fab和scFv在细胞内表达量均不相同，表达量的高低在很大程度上受抗体片段本身骨架的影响。 Some whole antibody and Fab or scFv expression levels are not the same, the level of expression of an antibody fragment is heavily influenced by the cell itself in the skeleton. 一般认为作用革巴标在质外体则IgG或Fab是最佳选择，而scFv是内质网内靶标免疫调节的最佳选择。 It is generally believed that the role of IgG Gerba marked in the apoplast or Fab is the best option, and the best choice is the scFv endoplasmic reticulum target immunomodulation. 用植物表达完全抗体可采用不同的策略。  with a plant expressing antibodies can be entirely different strategy. 一种是把重链和轻链基因分别转化植物，再通过有性杂交获得共表达植株;也可用两个基因的载体共转化同一植物，筛选获得共表达植株，还可把两个基因构建到同一个T-DNA上，使转基因工作更容易。 One is the heavy and light chain genes were transformed into plants by sexual crossing is obtained and then co-expressing plants; vectors may also be co-transformed with the two genes in the same plant, co-expression plants screened, two genes may also be constructed into the on the same T-DNA, transgenic work easier. 抗体基因表达与功能鉴定可首先用原生质体进行。 Gene expression and identification of the antibody may be first carried out with protoplasts. 也可筛选建立抗体分泌细胞系用于抗体的发酵生产。 Screening can also be established fermentative production of antibody-secreting cell lines for antibody. 抗体基因导入受体植物的途径通常是农杆菌介导法和基因枪轰击法，其它多种转基因方法也都可采用。 Ways antibody gene into a recipient plant is generally Agrobacterium tumefaciens and the bombardment process, also a variety of other transgenic methods can be used. 植物抗体的回收及纯化通常包含多项步骤，如提取、沉淀、吸附、层析和渗滤等。 Recovery and purification plants often include multiple steps antibody, such as extraction, precipitation, adsorption, chromatography, diafiltration, and the like. 目前，基因工程抗体的表达系统主要有哺乳动物细胞、大肠杆菌、酵母、昆虫以及植物。  Currently, genetically engineered antibody expression systems are mainly mammalian cells, E. coli, yeast, insect and plant. 1)哺乳动物细胞表达体系：鼠骨髓瘤细胞是最理想的表达宿主，此外还有一些B淋巴细胞来源的细胞系。 1) mammalian cell expression systems: murine myeloma cells is the best expression host, in addition to some B lymphocyte-derived cell lines. 这些细胞具有一整套完整的合成、组装、分泌免疫球蛋白的细胞装置， 能够产生完整的抗体分子。 These cells have a complete set of synthesis, assembly, immunoglobulin-secreting cell apparatus capable of generating a complete antibody molecules. 哺乳动物细胞表达的优点是能够将抗体多肽链正确装配、折叠并糖基化成有活性的完整分子，可以表达足够量的抗体，但生产成本高。 Advantage of mammalian cells expressing the antibody polypeptide chains is capable of correctly assembled and folded into complete glycosylation active molecules, can express a sufficient amount of an antibody, but high production costs. 2)大肠杆菌体系： 大肠杆菌已被广泛地用于表达抗体功能片断，如Fab、Fv和scFv，但目前它还不能表达完整的抗体分子。 2) E. coli system: E. coli has been widely used to express functional antibody fragments such as Fab, Fv and scFv, but it can not express an intact antibody molecule. 利用大肠杆菌表达小分子抗体，具有规模大、速度快和成本低的优点，应用前景喜人。 E. coli expression of small molecular antibody, with large-scale, high speed and low cost advantages, prospects gratifying. 但原核表达中的一个重要问题是如何有效地控制转录的起始，进行预想的表达。 But an important question prokaryotic expression is how to effectively control the transcription initiation, conduct expected of expression. 目前已有两种类型的表达载体用于抗体的表达：IPTG诱导型和温度诱导型，它们各自的启动子tac2和KPL分别受IPTG和温度的控制。 At present, two types of expression vectors for expressing antibodies: temperature IPTG inducible and inducible promoters tac2 their respective KPL respectively and IPTG and temperature controlled. 3)酵母表达体系：酵母能够有效地表达、组装和分泌具有免疫活性的抗体或其功能片断，但由于酵母对多肽的糖基化作用与哺乳动物细胞的修饰情况不同，从而影响了抗体的ACDC(依赖抗体的补体介导的细胞毒性)效力。 3) Yeast expression systems: Yeast can be efficiently expressed, assembled and secreted antibodies having immunological activity or a functional fragment, but due to different circumstances modified yeast glycosylation of the polypeptide and mammalian cells, thus affecting the antibody ACDC (antibody-dependent complement-mediated cytotoxicity) potency. 目前认为酵母并非是好的表达体系。 Now that the yeast is not a good expression system. 4)植物表达体系：1989年美国医学生物学家Hiatt首次报道了抗体在植物中的表达。 4) plant expression system: In 1989 the American Medical biologist Hiatt was first reported expression of antibodies in plants. 他的研究结果是人类利用异质细胞表达抗体的成功范例，打破了动植物种属之间的界限，引起了生物界的极大兴趣和高度重视。 His findings are the use of heterogeneous cells expressing human antibodies success stories, breaking the boundaries between plant and animal species, the biosphere caused great interest and attention. 目前用于表达完整抗体、Fab和scFv等抗体功能片断的植物有烟草和拟南芥菜。 Plant is currently used to express the whole antibody, Fab and scFv and other functional fragments of antibodies have tobacco and Arabidopsis thaliana. 植物表达抗体的一大优势是能将全长重链和轻链组装成带有Fc区域的全抗体(而大肠杆菌能组装的最大抗体片段为单价Fab片段）， 这些抗体能功能性的识别抗原并结合抗原。 One advantage of plant expression of antibodies is capable of full-length heavy and light chains assembled into whole antibodies with an Fc region (maximum and antibody fragments in E. coli can be assembled as monovalent Fab fragments), which can be functional antibody recognizing an antigen and binding to the antigen. 单克隆抗体是由2条重链和2条轻链组装成的四聚体。  The monoclonal antibody is assembled from two heavy chains and two light chains into tetrameric. 重链和轻链一般都通过不同的基因表达框分别表达。 Heavy and light chains are usually expressed by different expression cassette. 或者通过IRES(internal ribosome entry site)系统，将两个基因在同一个转录子上表达，但这些方法都无法实现重链和轻链的等量表达。 Alternatively, the two genes on a single transcript expressed by the IRES (internal ribosome entry site) system, but these methods can not achieve an equal amount of expression of heavy and light chains. 如通过不同的基因表达框，尽管使用相同的启动子和终止子序列，但由于在基因转化过程中转基因在基因组中的插入位置不同，它们的表达受到周围基因组序列的影响产生位置效应，而使得重链和轻链蛋白的表达量不同。 The different expression cassettes genes, although the same promoter and terminator sequences, but due to the genetic transformation of the transgene inserted position in the genome different, whose expression is affected genomic sequence is generated around the position effect, so that different expression of heavy and light chain proteins. 而使用IRES系统虽然重链和轻链在同一个转录子上，但在蛋白质翻译过程中由于IRES后面基因的翻译效率比前一个低，因此重链和轻链的表达量仍然不同。 Although the use of IRES system heavy and light chains on the same transcript, but in the process of protein translation because the translation efficiency of gene behind IRES lower than the previous one, and therefore the expression of the heavy and light chains are still different. 如以前通过水稻表达体系虽然也能形成完整的Bevacizumab抗体（陈磊、于为常， 2015)，但由于表达系统中抗体的重链和轻链比例不佳，影响产量及抗体质量，如完整抗体四聚体的组装效率低，抗体降解等。 Bevacizumab antibodies as described previously by rice expression system, although it can form a complete (Chen Lei, in normally, 2015), but because of the poor antibody expression system of the proportion of heavy and light chains, yield and quality of the antibodies, such as intact antibodies four mer assembly efficiency is low, degradation of the antibody. 另外在植物表达的重组蛋白，经常受到植物特异性糖基化的影响。  Further, in the recombinant protein expression in plants, often affected plant-specific glycosylation. 而植物特异性蛋白糖基化，如βΐ，2-xylose和al，3-fucose都发生在高尔基体(Golgi)。 The plant-specific glycosylation of proteins, such as βΐ, 2-xylose and al, 3-fucose occur in the Golgi apparatus (Golgi). 植物特异性糖基化会影响抗体的一些特性，如抗体的结合力，抗体在循环系统中的稳定性及引起人体对抗体的免疫反应等。 Plant-specific glycosylation affect some properties of the antibody, such as binding strength of antibodies, the stability in the circulatory system and cause the body's immune response to the antibody, and the like. 这些特性是植物表达重组蛋白的主要缺陷，需要克服。 These characteristics are the main flaw of plant expression of recombinant proteins, need to be overcome. 本发明的目的在于克服现有技术存在的不足，提出全新的一种优化的植物源重组人源化贝伐单克隆抗体的制备方法及医药应用。  The object of the present invention is to overcome the shortcomings of the prior art, the proposed new method for preparing an optimized plant derived recombinant humanized monoclonal antibody bevacizumab, and pharmaceutical applications. 本发明还有一个目的在于将新法研制的贝伐单克隆抗体用于医药，用于治疗乳腺癌，用于治疗肺癌、恶性胶质瘤、肾癌、子宫颈癌、卵巢癌、结肠癌和直肠癌。  Another object of the present invention is to develop new methods for the monoclonal antibody bevacizumab used in medicine for the treatment of breast cancer, for treating lung cancer, malignant glioma, renal cancer, cervical cancer, ovarian cancer, colon cancer and colorectal cancer. 步骤2.以水稻密码子优化并合成上述融合蛋白基因，如序列2)所示；其中包含5' PacI (TTAATTAA)和3 ' Mlul (ACGCGT)限制性内切酶位点。  Step 2. Synthesis of rice and the above-described codon-optimized fusion protein gene, as shown as Sequence 2); contains endonuclease sites within the 5 'PacI (TTAATTAA) and 3' Mlul (ACGCGT) limiting. 步骤3.构建贝伐单抗植物双元表达载体。  Step 3. Construction of the binary plant expression vector bevacizumab. 将融合蛋白基因DNA片段通过PacI和Mlul限制性内切酶位点插入到双元载体pUNl390上的基因表达框，该基因位于玉米ubiquitin启动子的后面，及Nos终止子的前面(图1)。 Protein fusion gene DNA fragment by the restriction enzymes PacI and Mlul site was inserted into the expression cassette in the binary vector pUNl390, the gene is located behind the maize ubiquitin promoter, the promoter and the Nos terminator front (FIG. 1). 步骤4.采用农杆菌介导法将抗体基因导入水稻愈伤组织细胞并通过潮霉素筛选获得遗传转化水稻植株。  Step 4. The use of Agrobacterium-mediated transformation into rice callus cells and screened for antibody genes to obtain genetically transformed rice plants hygromycin. 步骤5.采用Southern Blot以及Western Blot方法检测贝伐单抗在水稻中的表达。  Step 5. Using Southern Blot and Western Blot to detect the expression bevacizumab in rice. 步骤6.通过酶联免疫(ELISA)检测水稻中抗体的活性和含量。  Step 6. activity and content of rice antibody was detected by enzyme-linked immunoassay (ELISA). [0032 ] 步骤7.通过Pro te i nA亲和柱分离纯化，得到贝伐单克隆抗体。  Step 7. i nA isolated and purified by affinity column Pro te, bevacizumab, a monoclonal antibody obtained. 步骤8 ·通过SPR检测抗体对抗原的结合力。  Step 8. binding force to the antigen by SPR detection antibody. 步骤9.通过蛋白酶水解及质谱分析仪分析贝伐单克隆抗体糖基化。  Step 9. The monoclonal antibody bevacizumab glycosylation by proteolysis and mass spectrometry analysis. 进一步的，将本发明制备方法得到的贝伐单克隆抗体与常用药物载体制备生物药物应用于人体源。  Further, the production method of the present invention obtained with conventional monoclonal antibody bevacizumab medicament drug carrier applied to human biological source. 更进一步的，将贝伐单克隆抗体制备的生物药物用于治疗乳腺癌，肺癌、恶性胶质瘤、肾癌、子宫颈癌、卵巢癌、结肠癌以及直肠癌。  Still further, the biopharmaceutical preparation of a monoclonal antibody Avastin for breast cancer, lung cancer, malignant glioma, renal cancer, cervical cancer, ovarian cancer, colon and colorectal cancer. 通过设计Furin蛋白酶切位点，切除2A序列，不影响抗体的结构及功能。  By designing Furin protease cleavage sites, excised 2A sequence, does not affect the structure and function of antibodies. 本发明通过在植物中表达重组抗体Bevacizumab的重链和轻链融合蛋白，由于在融合蛋白中加入2A序列，使得抗体的重链和轻链得到接近1:1比例的表达，这个比例对完整抗体的组装起到明显的促进作用，我们的结果表明应用此系统表达的抗体产量较高。  The present invention is a fusion protein by expression of a recombinant antibody Bevacizumab in plants heavy and light chains, due to the addition 2A sequence in a fusion protein, such that the heavy and light chain of an antibody obtained close to 1: 1 expression ratio, this ratio play a significant role in promoting an intact antibody assembly, our results suggest that a higher yield of antibody expression apply this system. 同时由于重组抗体的重链和轻链等比例的组装成比较稳定的四聚体结构，而减少了比较易降解的未组装多肽，因而得到较纯净一致的单克隆抗体。 And because the ratio of recombinant antibody heavy and light chains assemble into relatively stable tetrameric structure, a relatively easy degradation reduces unassembled polypeptide, thereby obtaining a more uniform pure monoclonal antibody. 另外由于在2A序列前设计了Furin蛋白酶切点，使得2A序列在表达后被切除，从而得到的抗体不含有2A序列，避免了因为引入额外序列而引起的抗体结构和功能的变化。 In addition, as before 2A sequence designed Furin protease cleavage site, the 2A sequence such that expression after excision, thus obtained does not contain a 2A sequence antibodies, to avoid changes in the antibody structure and function as the introduction of additional sequences caused. 通过在抗体重链和轻链多肽C末端添加KDEL内质网保留序列，使得抗体保留在内质网中，而不经过高尔基体分泌途径，减少了经高尔基体而产生的植物特异性糖基化。 By addition of the KDEL endoplasmic reticulum antibody heavy and light chain polypeptide sequences retain the C-terminus, such that the antibody retained in the endoplasmic reticulum, Golgi apparatus without passing through the secretory pathway, reduce the plant-specific sugar produced by the Golgi glycosylation . 而植物特异性糖基化一般会影响重组蛋白的结构、功能，抗体在人体循环系统的稳定性及引起人体对该抗体的免疫反应。 The plant-specific glycosylation of recombinant proteins will generally affect the structure, function, stability of the antibody and the human circulatory system causes an immune response in the human antibody. 图1为本发明的贝伐单抗植物表达载体的构建图，其中融合蛋白基因BHC-KDEL-Furin-GSG-2A-BLC-KDEL位于玉米转录启动子PUbi后，Nos转录终止子TNos前。  FIG 1 bevacizumab plant expression construct of the present invention, FIG vector, the gene BHC-KDEL-Furin-GSG-2A-BLC-KDEL maize transcriptional promoter located PUbi wherein the fusion, Nos transcription terminator TNos before. Hptll基因在CaMV35S启动子(P35S)和35S终止子(T35S)之间表达潮霉素抗性基因，用于转基因植物的筛选。 Hptll gene expression between the promoter (P35S) and the 35S terminator (T35S) a hygromycin resistance gene, for screening of transgenic plants in CaMV35S. LB和RB分别为农杆菌双元载体pUNl 390的左右边界。 LB and RB are left and right borders of Agrobacterium binary vector in pUNl 390. (b)EcoRI酶切，利用潮霉素基因（hptll)作为探针，杂交显示不同转基因植物中转基因拷贝数的变化，其中3、5、6、10为单拷贝转基因事件;7、9、11、13、15为两个拷贝转基因事件；其他为多拷贝转基因事件；2是野生型水稻DNA为阴性对照，1是质粒DNA作为阳性对照。  (b) EcoRI digested, using the hygromycin gene (hptll) as a probe, hybridization of different gene copy number changes transit transgenic plant, wherein the transgenic event 3,5,6,10 single copy; 7, 9,11,13,15 two copies of the gene transfer events; transgenic events other multiple copies; 2 wild-type DNA of rice as a negative control, a plasmid DNA as a positive control. 图6为本发明采用Western Blot分析贝伐单抗在转基因水稻中的表达。  6 expression using Western Blot analysis bevacizumab in transgenic rice in the present invention. [0051 ] 其中，A)变性胶，B)非变性胶。  wherein, A) denaturing gel, B) non-denaturing gel. PC: Bevacizumab单克隆抗体(Avastin，Lot No : HO 129; Roche Pharma，Switzerland)作为阳性对照，NC为野生型水稻蛋白为阴性对照，#1-9 为转基因水稻。 PC: Bevacizumab monoclonal antibody (Avastin, Lot No: HO 129; Roche Pharma, Switzerland) as a positive control, NC is a wild type rice protein as a negative control, # 1-9 Transgenic rice. 图10为本发明的不同转基因植物中SDS-PAGE检测提纯抗体(~150kD)示意图。 Different transgenic plants  FIG. 10 of the present invention, the antibody was purified by SDS-PAGE (~ 150kD). FIG. 其中，1-2: 5yg抗体;3-4: 2yg抗体;5-6: lyg抗体;7:0 · 5yg阿瓦斯汀对照。  wherein, 1-2: 5yg antibodies; 3-4: 2yg antibodies; 5-6: lyg antibodies; 7: 0 · 5yg Avastin control. 图12为表面等离子共振(SPR)检测本发明的抗体与抗原的结合情况图. FIG. 12 is a surface plasmon resonance (SPR) detection of antibody to the antigen binding of the present invention, FIG. 其中，HL为从转基因水稻中提纯的Bevacizumab抗体。  wherein, HL is purified from the transgenic rice antibody Bevacizumab. 结合附图及实施例进一步描述本发明的技术方案[0061 ]实施例1Bevacizumab抗体融合蛋白的设计，合成及植物表达载体的构建如附图1所示，设计含有2A序列及Furin切点的贝伐单抗重链和轻链融合蛋白。 FIG, 2A comprising sequence design examples further aspect of the present invention is described in  Example 1Bevacizumab design antibody fusion protein embodiments, Synthesis and Construction of Plant Vector  The figures 1 Expression  embodiments and the accompanying drawings and Furin cut-off point of bevacizumab heavy and light chain fusion protein. 如序列表SEQ ID N0:1所示，序列依次包含:抗体重链序列BHC，内质网保留序列（KDEL)(SEQ ID N0:2)，Furin 蛋白酶切割位点（RRKR)(SEQ ID N0:3)，连接肽（GSG)，2A 序列(QLLNFDLLKLA ⑶ VESNPGP)(SEQ ID N0:4)，抗体轻链序列BLC(SEQ ID N0:5)内质网保留序列（KDEL)。 The Sequence Listing SEQ ID N0: 1, the sequence comprises, in order: the BHC antibody heavy chain sequence, an endoplasmic reticulum retention sequence (KDEL) (SEQ ID N0: 2), Furin protease cleavage site (RRKR) (SEQ ID N0: 3), connecting peptide (GSG), 2A sequence (QLLNFDLLKLA ⑶ VESNPGP) (SEQ ID N0: 4), an antibody light chain sequence BLC (SEQ ID N0: 5) endoplasmic reticulum retention sequence (KDEL). 以水稻密码子优化并合成上述融合蛋白基因，如序列2所示。 Rice codon-optimized genes and synthesis of the fusion protein, the sequence as shown in Fig. 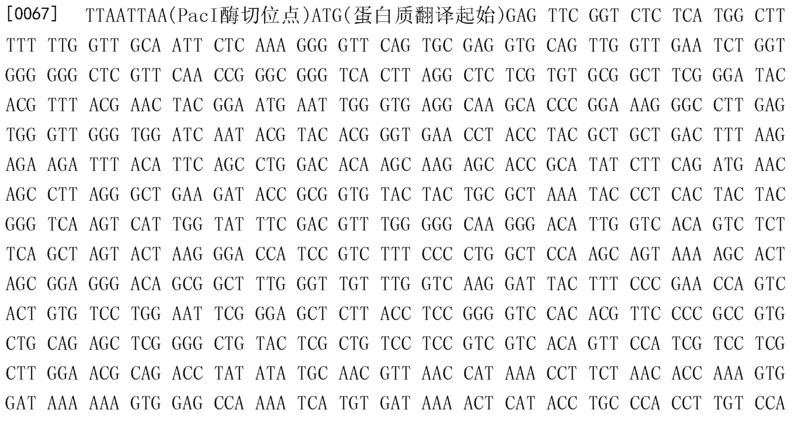 其中包含5'PacI (TTAATTAA)和3 ' Mlul (ACGCGT)限制性内切酶位点。 Which comprises 5'PacI (TTAATTAA) and 3 'Mlul restriction enzyme sites within the (ACGCGT) limiting. 1)水稻愈伤组织的诱导:将成熟的日本晴种子去壳，用75 %的酒精消毒30秒，再用5%次氯酸钠溶液消毒25分钟，无菌水漂洗3~5次，置无菌纸上，在超净工作台上吹干，接种于N6D2愈伤组织诱导培养基上，每个培养皿接种12~15粒，于28 °C暗培养4周，期间切除胚根，每两周继代一次。 Rice callus induction  1): The mature seed shell Nipponbare, disinfected with 75% alcohol for 30 seconds and then sterilized 5% sodium hypochlorite solution for 25 minutes, rinsed with sterile water three to five times, no set bacteria paper, and dry clean table, N6D2 plated on callus induction medium, each dish was inoculated 12 to 15, dark at 28 ° C for 4 weeks, during removal of the radicle, every two ZHOU Ji-generation once. 2)根癌农杆菌的活化：1)将转化了贝伐单抗质粒的农杆菌(EHA105)接种在含有50mg/L的卡纳霉素和50mg/L利氟平的LB液体培养基中，28°C，转速200转每分钟振荡培养18 小时;2)取lml培养好的农杆菌放在2ml灭菌的离心管中，转速6000转每分钟，离心5分钟收集菌体，用200μ1的AAM液体培养基重悬菌体，取10μ1菌液接种到50ml含有200μΜ AS(乙酰丁香酮)的AAM液体培养基中，28°C，转速160转每分钟振荡培养2小时，以备转化之用。  2) activation of Agrobacterium tumefaciens: 1) The transformed Agrobacterium plasmid bevacizumab (EHA105) was inoculated containing 50mg / L of kanamycin and 50mg / L Lee LB liquid culture fluoro-level group, 28 ° C, shaking speed of 200 revolutions per minute, 18 hours; 2) takes place lml Agrobacterium culture good 2ml sterile centrifuge tubes, 6000 rpm, cells were collected by centrifugation for 5 min per minute, with AAM broth 200μ1 resuspended cells, bacteria take 10μ1 inoculated into liquid AAM medium containing 50ml 200μΜ AS (acetosyringone) of, 28 ° C, shaking speed of 160 revolutions per minute for 2 hours to prepare for conversion purposes. [0071 ] 3)农杆菌转化水稻胚性愈伤组织：1)浸染，选取直径为3~5mm的结构致密的愈伤组织颗粒，在制备好的AAM菌液中浸染10min;2)共培养，将浸染后的愈伤组织放在无菌滤纸上吸去组织表面的菌液，转接至共培养基N6D2-CO上，26 °C暗培养3天;3)选择培养，将共培养3天的愈伤组织用含有0.01 %吐温的无菌水漂洗5次，然后在含500mg/L头孢霉素的无菌水中漂洗10分钟，将愈伤组织放置无菌滤纸上，在超净工作台上晾干愈伤组织上的水，再转接至选择培养基N6D-Se上，28°C暗培养四周（图2);4)分化培养，将抗性愈伤组织转接至分化培养基MS-Re上，16小时光照，8小时黑暗，28°C培养至分化出绿苗（图3)。  3) Agrobacterium transformation of rice embryogenic callus: 1) disseminated, selected calli of diameter 3 ~ 5mm particle structure of dense, dip in the prepared AAM bacilli 10min; and 2) co-cultivation, the callus after disseminated on sterile filter paper to absorb the tissue surface bacteria, to co-transfer medium on N6D2-cO, 26 ° C dark for 3 days; 3) selection culture, will be co-cultured for 3 days the calli containing 0.01% Tween rinsed five times with sterile water, and then rinsed in sterile water containing 500mg / L cefotaxime for 10 minutes, the callus is placed on sterile filter paper in a clean bench water to dry on the callus, and then transfer onto selection medium N6D-Se, 28 ° C dark culture for four weeks (FIG. 2); 4) differentiation culture, the adapter resistant callus to differentiation medium the MS-Re, 16 h light, 8 h dark, 28 ° C to culture differentiated plantlets (FIG. 3). 将小苗转接至用灭菌瓶装的生根培养基MS-Hf上，培养2周后，洗净小苗根上的培养基转到水中培养3天，然后移栽到大田（图4)。 After the seedlings with the transfer to the sterilized bottles rooting medium MS-Hf, cultured for 2 weeks, the cleaning medium plantlets to root in water for 3 days, and then transplanted to the field (FIG. 4). N6D2培养基：3.9g/L Chus N6(Chu，1975)(CHP01-50LT，10402809，Caisson，USA)， N6维生素，（2π^/1甘氨酸，0 · 5mg/L烟酸，1 · Omg/L维生素B1，0 · 5mg/L维生素B6)，0 · lg/L肌醇，1. Og/L水解酪蛋白，0.5g/L脯氨酸，0.5g/L谷氨酰胺，2mg/L 2，4-二氯苯氧乙酸（2，4-D)，30g/L蔗糖，1M Κ0Η调节pH5 · 8，3 · Og/L植物凝胶，121°C，220KPa，灭菌20分钟。  N6D2 medium: 3.9g / L Chus N6 (Chu, 1975) (CHP01-50LT, 10402809, Caisson, USA), N6 vitamins, (2π ^ / 1 glycine, 0 · 5mg / L nicotinic acid, 1- Omg / L vitamin B1,0 · 5mg / L vitamin B6), 0 · lg / L myo-inositol, 1. Og / L casein hydrolyzate, 0.5g / L proline, 0.5g / L glutamine, 2mg / L 2,4- dichlorophenoxyacetic acid (2,4-D), 30g / L sucrose, 1M Κ0Η adjusting pH5 · 8,3 · Og / L phytagel, 121 ° C, 220KPa, sterilized for 20 minutes. N6D2-Se培养基：N6D2培养基冷却到50°(：，121°(：，220砑3，灭菌20分钟，加入5011^/1 潮霉素B和500mg/L头孢霉素。  N6D2-Se medium: N6D2 medium was cooled to 50 ° (:, 121 ° (:, 220 3 calendering, sterilized for 20 minutes, 5011 ^ / 1 Hygromycin B and 500mg / L cefotaxime. MS-Re培养基：4 · 6g/L MS(M10400-50 · 0，P06968，rpi，USA)，2 · 0mg/L6-苄氨基腺嘌呤(6-BA)，0 · 5mg/L萘乙酸(NAA)，1 · Omg/L激动素(KT)，30g/L蔗糖，30g/L山梨醇，1M Κ0Η调节pH5 · 8，3 · Og/L Gelrite，121°C，220KPa，灭菌20分钟，冷却到50°C，加入50mg/L潮霉素B和500mg/L头孢霉素。  MS-Re medium: 4 · 6g / L MS (M10400-50 · 0, P06968, rpi, USA), 2 · 0mg / L6- benzylamino adenine (6-BA), 0 · 5mg / L naphthalene acetic acid (NAA), 1 · Omg / L kinetin (KT), 30g / L sucrose, 30g / L sorbitol, 1M Κ0Η adjusting pH5 · 8,3 · Og / L Gelrite, 121 ° C, 220KPa, sterilization for 20 minutes, cooled to 50 ° C, was added 50mg / L hygromycin B and 500mg / L cefotaxime. ]\^-册培养基：2.38/1]\^(]\110400-50.0，？06968，邝1，1]5厶），3(^/1蔗糖，謂1(0!1调pH5 · 8，3 · 0g/L Gelrite，121°C，220KPa，灭菌20分钟，冷却到50°C，加入50mg/L潮霉素B。 ] \ ^ - Medium Volume: 2.38 / 1] \ ^ (] \ 110400-50.0, 06968, Kwong 1,1] 5 Si? ), 3 (^ / 1 sucrose, that one (01 tune! pH5 · 8,3 · 0g / L Gelrite, 121 ° C, 220KPa, sterilized for 20 min, cooled to 50 ° C, was added 50mg / L hygromycin B.
 AAM培养基：0.5g/L水解酪蛋白，68.5g/L蔗糖，36g/L葡萄糖，0.9g//L谷氨酰胺， 0 · 3g/L天冬氨酸，3g/L氯化钾，10mg/L五水硫酸猛，3 · 0mg/L硼酸，2 · 0mg/L七水硫酸锌， 0 · 25mg/L二水钼酸纳，0 · 025mg/L五水硫酸铜，0 · 025mg/L六水氯化钴，0 · 75π^/1碘化钾， 15mg/L二水氯化|丐，2511^凡七水硫酸镁，4mg/L乙二胺四乙酸(EDTA)，15mg/L二水磷酸二氢钠，lmg/L烟酸，lmg/L维生素B6，10mg/L维生素Bl，100mg/L肌醇，176mg/L精氨酸，75mg/L甘氨酸，1M Κ0Η调节pH到5·2，0·22uM滤膜过滤除菌。  AAM medium: 0.5g / L casein hydrolyzate, 68.5g / L sucrose, 36g / L glucose, 0.9g // L-glutamine, 0 · 3g / L-aspartic acid, 3g / L chloride potassium, 10mg / L Meng sulfate pentahydrate, 3 · 0mg / L of boric acid, 2 · 0mg / L of zinc sulfate heptahydrate, 0 · 25mg / L sodium molybdate dihydrate, 0 · 025mg / L copper sulfate pentahydrate, 0.5 025mg / L of cobalt chloride hexahydrate, 0 · 75π ^ / 1 potassium iodide, 15mg / L chloride dihydrate | hack, 2511 ^ where the magnesium sulfate heptahydrate, 4mg / L ethylenediaminetetraacetic acid (EDTA), 15mg / L sodium dihydrogen phosphate dihydrate, lmg / L nicotinic acid, lmg / L vitamin B6,10mg / L vitamin Bl, 100mg / L myo-inositol, 176mg / L arginine, 75mg / L glycine, 1M Κ0Η adjusted to pH 5.2 2,0 · 22uM filter to sterilize. 1)制备地高辛标记的探针：以贝伐单抗双元表达载体DNA为模板，轻链(BLC)和潮霉素基因(hptll)的正反向引物分别扩增制备轻链和hptll的地高辛标记的探针。  1) Preparation of the digoxigenin-labeled probes: bevacizumab binary expression vector DNA as a template, the light chain (BLC) and the hygromycin gene (hptll) forward and reverse primers to amplify the production of light chain and ground hptll digoxigenin-labeled probe. [0081 ] PCR反应溶液为：质粒DNAlOng作为模板，正反向引物各lyL，Premix Ex Taq Hot Start Version 15μ1，1μL的DIG-dUTP，双蒸水定容到30yL。  PCR reaction solution was as follows: DNAlOng plasmid as a template, the forward and reverse primers were each lyL, Premix Ex Taq Hot Start Version 15μ1,1μL of DIG-dUTP, double distilled water to a volume 30yL. PCR扩增反应程序为:95 °C 5分钟，95 °C 20秒，60 °C 20秒，72 °C 1.5分钟，30个循环，72 °C 5分钟。  PCR amplification program for the reaction: 95 ° C 5 minutes, 95 ° C 20 seconds, 60 ° C 20 seconds, 72 ° C 1.5 min, 30 cycles, 72 ° C 5 min. PCR反应结束后，取3yL反应液电泳检测。 After completion of the PCR reaction, electrophoresis was taken 3yL reaction. 2)转贝伐单抗基因水稻总DNA的酶解:转贝伐单抗基因水稻叶片总DNA 15ug，用EcoRI进行酶解，37 °C反应过夜。  2) digested total DNA transfected bevacizumab transgenic rice: bevacizumab transfer leaves of rice total DNA 15ug, be digested with EcoRI, 37 ° C overnight. 每个样品的酶解反应体系为：总DNA 15yg，CutSmart缓冲液10yL，100U的EcoRI，双蒸水定容100yL。 Enzymatic reaction system for each sample as follows: Total DNA 15yg, CutSmart buffer 10yL, EcoRI 100U, and double distilled water to volume 100yL. 其中以野生型水稻基因组DNA作为阴性对照，贝伐单抗质粒为阳性对照。 Wherein the wild type rice genomic DNA as a negative control, bevacizumab plasmid as a positive control. 酶解反应结束后，上样5yL进行电泳检测，纯化，溶解在15yL双蒸水中，4 °C备用或-20°C保存。 After the enzymatic hydrolysis, the samples electrophoresed 5yL detection, purification, was dissolved in double distilled water 15yL, 4 ° C or at -20 ° C standby. 3)酶解产物的电泳:将纯化后的酶解产物上样于1.0%琼脂糖凝胶，以5V/cm电压电泳3小时；拍照，标记分子量的位置;将凝胶放到0.2N盐酸中处理10分钟，用双蒸水漂洗一下;放入变性缓冲液中处理30分钟;放入中和缓冲液中处理30分钟。  3) hydrolysates electrophoresis: The purified product was digested on the sample in a 1.0% agarose gel at 5V / cm 3 hours electrophoresis voltage; camera, the position of molecular weight markers; the gel onto 0.2 of N hydrochloric acid for 10 minutes, rinsed with double distilled water at; placed in denaturing buffer for 30 minutes; and placed in the buffer for 30 minutes. 4)DNA印记到杂交膜:根据琼脂糖凝胶的大小，剪取大小合适的杂交膜，用双蒸水润湿;玻璃板放在托盘上，取1张3M滤纸，用转移缓冲液浸湿，放在玻璃板上，去除滤纸与玻璃板中的气泡。  4) DNA hybridization imprinted film: The size of the agarose gel, the blot clipping the right size, wetted with double distilled water; the glass sheet on the tray, taking a 3M filter paper with transfer buffer wetting liquid, on the glass filter paper and remove air bubbles in the glass. 在托盘中加入适量转移缓冲液;将凝胶放在滤纸上，去除凝胶和印迹表面间的气泡;将杂交膜放在凝胶上面，并再次排气泡;将2张3M滤纸（比杂交膜稍大)转移缓冲液湿透后放在杂交膜上;在胶的周围放上一圈保险膜，防止液池中的液体直接流到凝胶上方的纸巾层（即"短路"现象）。 Adding an appropriate amount of transfer buffer in the tray; the gel on a filter paper to remove air bubbles between the gel and the blot surface; hybridized membrane was placed on top of the gel, and bubble discharge again; 3M the two filters (specific hybridization after the film is slightly larger) soaked in transfer buffer blots; rupture disk placed in a circle around the gum to prevent the liquid from flowing directly to the liquid bath tissue layer over the gel (i.e., a "short" phenomenon). 在滤纸上放一叠吸水纸，然后压上重约300g的物体，转移过夜； 将杂交膜在稀释10倍的转移缓冲液中漂洗一下，置于超净台下晾干，于80°C烘箱烘2小时。 A stack of filter paper placed on absorbent paper, then pressed on the body weight of about 300g, transferred overnight; hybridized membrane was rinsed at 10-fold diluted in the transfer buffer and placed to dry clean the audience, an oven at 80 ° C bake for 2 hours. 5)杂交:将烘烤后的膜用灭菌水润湿卷起，放入杂交管中，加入30ml杂交液，放在42 °C预杂交2小时；倒掉预杂交液，再加入10ml新的杂交液于42 °C预热；取出已经做好的探针，冰上融化，加入到已经预热的杂交液里，42 °C杂交过夜。  5) Hybridization: The rolled film after baking wetted with sterilized water, into the hybridization tube, 30ml of the hybridization solution, 42 ° C in two hours prehybridization; prehybridization solution discarded, and then 10ml of hybridization solution was added fresh preheated at 42 ° C; probe is well removed, thawed on ice, added to the hybridization solution having been preheated in, 42 ° C hybridized overnight. 6)杂交后处理:倒出杂交液，在杂交管中倒入100ml洗脱缓冲液W1，室温下洗脱5分钟，重复一次。  6) treatment of post-hybridization: hybridization solution was decanted, poured into 100ml of the hybridization tube elution buffer W1, eluted at room temperature for 5 minutes was repeated once. 倒掉洗脱缓冲液W1，加入100ml洗脱缓冲液W2，于65°C洗脱15分钟，重复一次； 取出膜，放入铺有保鲜膜的小平盘中，加入洗脱缓冲液W3,洗脱5分钟;倒掉洗脱缓冲液W3， 加入50ml封闭液S1，室温孵育15分钟;倒掉封闭液S1，加入10ml地高辛抗体反应液S2，孵育15分钟;将膜取出放入另一个盒子，加入100ml洗脱缓冲液W3,室温下洗脱15分钟，重复洗脱一次;加入20mL的检测缓冲液S3，孵育5分钟;倒掉检测缓冲液S3，加入2ml CSH)孵育5分钟； 将膜取出平铺在保鲜膜上，将其包裹起来，放在37°C孵育5分钟。 Discard elution buffer W1, W2 of elution buffer was added 100ml, eluted at 65 ° C 15 minutes was repeated once; membrane was removed, placed in a covered with plastic wrap square plate, W3 of elution buffer was added, washed off 5 minutes; Discard elution buffer W3, blocking solution was added 50ml S1, incubated for 15 minutes at room temperature; blocking buffer discarded S1, added 10ml digoxin antibody reaction solution S2, incubated for 15 minutes; the film was taken out into another cassette, was added 100ml W3 of elution buffer, the elution at room temperature for 15 minutes, and elution was repeated once; S3 20mL assay buffer was added and incubated for 5 min; Discard assay buffer S3, added 2ml CSH) for 5 min; and remove the tile in fresh film membrane, which was wrapped up in 37 ° C for 5 minutes. 7)显影和定影:将包好的膜放在暗匣子中，在暗房中将X-胶片放在包好的膜上，关闭暗夹，37°C放置30分钟；回暗室中取出胶片，放入显影液中浸泡2分钟，在水中冲一下，再放入定影液浸泡2分钟，在流水中冲洗胶片，取出晾干。  7) developing and fixing: the dark box wrapped in film, the film will be placed in an X- darkroom wrapped film to close the clip dark, 37 ° C for 30 min; taken back into the darkroom film, soaked into the developing solution for 2 minutes, washed in water, another soak into the fixing solution for 2 minutes, rinsed in running water film, dry out. 地高辛抗体反应液S2:将Anti-Digoxigenin-AP以10000转每分钟离心5分钟，吸取上层溶液以1:10000溶解于封闭液S1。  The reaction solution digoxin antibody S2: The Anti-Digoxigenin-AP per centrifuged at 10,000 rpm for 5 minutes, the supernatant solution was drawn at 1: 10,000 in blocking solution were dissolved S1. a)以转基因水稻叶片为材料，在液氮中研磨。  a) In leaves of transgenic rice, ground in liquid nitrogen. 称取30mg研磨好叶片组织加入30μ1 提取缓冲液（200mM Tris-HCl，pH 8.0，100mM NaCl，400mMsucrose，10mM EDTA，lmM phenylmethylsulfonyl fluoride ,0.05%Tween20)，旋祸振荡，在冰上放置10分钟，然后在4°C，13000转每分钟离心10分钟，取上清到新的离心管中。 Weigh 30mg good grinding leaf tissue was added 30μ1 extraction buffer (200mM Tris-HCl, pH 8.0,100mM NaCl, 400mMsucrose, 10mM EDTA, lmM phenylmethylsulfonyl fluoride, 0.05% Tween20), disaster oscillating rotation, placed on ice for 10 minutes, then at 4 ° C, 13000 rpm for 10 minutes per minute, the supernatant to a new centrifuge tube. 2)电泳分离:将25yg提取总蛋白和SDS上样缓冲液混合，然后在变性条件下，样品上样前加5%巯基乙醇2-mercaptoethanol，煮5分钟变性)或非变性条件下跑10%SDS-PAGE 电泳。 The buffer was mixed on the sample 25yg total protein was extracted and SDS, then under denaturing conditions, before the sample was loaded with 5% mercaptoethanol 2-mercaptoethanol, boiled 5 minutes denaturation) or non-denaturing conditions:  2) electrophoretic separation running electrophoresis 10% SDS-PAGE. 100V电泳2小时。 100V for 2 hours. 3)转膜:卸下胶板，剥离胶，将胶浸于转移缓冲液中平衡lOmin。  3) wiped film: removing the plastic sheet, peeling adhesive, glue immersed in transfer buffer equilibrated lOmin. 依据胶的大小剪取膜和滤纸6片，将PVDF膜放入甲醇浸泡饱和3-5秒钟放入转移缓冲液中平衡lOmin。 And clipping filter membrane according to the size of glue 6, the PVDF membrane was immersed into methanol saturated 3-5 seconds and placed in transfer buffer equilibrated lOmin. 装配转移三明治:从下向上依次为3层滤纸、胶、PVDF膜、3层滤纸，每层放好后，用试管赶去气泡。 Sandwich transfer assembly: from bottom to top 3 layers of filter paper, gel, PVDF membrane, 3 layers of filter paper, put away after each use the tube rush bubbles. 插上电极，20V，45分钟。 Plug electrode, 20V, 45 min. 转膜结束后，切断电源，取出杂交膜。 After the transfer film, cut off the power, remove the blot. 4)免疫杂交与显色:将膜放入双蒸水中浸泡10分钟，取出放入20ml 5%脱脂奶粉的封闭液中室温孵育1小时。  4) immunoblotting and color: The film was placed in double distilled water and soaked for 10 minutes, remove the blocking solution into 20ml 5% skim milk at room temperature for 1 hour. 加入稀释5000倍的辣根过氧化酶(HRP)标记羊抗人IgG(LC+HC) (ProteinTech Group，USA)，室温孵育2小时。 5000-fold diluted horseradish peroxidase (HRP) labeled goat anti-human IgG (LC + HC) (ProteinTech Group, USA), incubated at room temperature for 2 hours. 15mlTBS-T洗3次，每次5min。 15mlTBS-T washed three times, each time 5min. 蛋白检测（按照Thermo Pierce ECL Western BlottingSubstrate试剂盒操作）。 Protein assay (Thermo Pierce ECL Western BlottingSubstrate according to kit). 5)变性SDS-PAGE显示出2个条带，分别为~50kDa重链和~25kDa轻链（图6A)。  5) denaturing SDS-PAGE showed two bands, respectively, ~ 50kDa ~ 25kDa heavy chain and the light chain (FIG. 6A). 6)非变性SDS-PAGE显示出1个~150kDa条带，为抗体四聚体（图6B)，没有观察到降解产物。  6) non-denaturing SDS-PAGE showed a ~ 150kDa band, the antibody tetramer (FIG. 6B), degradation products was not observed. 7)通过Image J软件分析图6A中条带的灰度值，计算轻链/重链的比例如表1。9个转基因株系中轻链/重链的比值平均数为0.99,和对照商品阿瓦斯汀的比值相同。 Ratio of  7) gray value analysis in FIG. 6A strip by Image J software, calculates the light chain / heavy chain of light chain / heavy chain is the average ratio as shown in Table 1.9 0.99 transgenic lines, and Avastin same control product ratio. 2)用lxPBST洗涤3次后，加入辣根过氧化酶(HRP)标记的streptavidine，并在25°C 孵育0.5小时。  2) After washing 3 times with lxPBST, horseradish peroxidase (HRP) labeled streptavidine, and incubated at 25 ° C 0.5 h.
 3)用lxPBST洗涤3次后，加入TMB底物，并在25 °C孵育20分钟。  3) lxPBST washed three times, TMB substrate was added and incubated at 25 ° C 20 min. 4)加终止液终止反应，用酶标仪在450nm波长检测颜色反应的读值。  4) was added to terminate the reaction was terminated using a microplate reader at 450nm wavelength detection value read color reaction. 5)以商品阿瓦斯汀作为阳性对照，非转基因植物作为阴性对照，转基因植物反应皆为阳性(图7)，证明转基因植物表达有活性的抗体，可以和抗原结合。  5) Avastin trade as a positive control, non-transgenic plant as negative control, the transgenic plants are all positive reactions (FIG. 7), demonstrating that transgenic plants expressing active antibodies, and antigen-binding can. 6)利用阿瓦斯汀为标准品，通过上述ELISA方法绘制标准曲线（图8)。  6) using Avastin as standard, the standard curve (FIG. 8) by the aforementioned ELISA method. 7)通过和标准曲线比较，计算出转基因植物中抗体的含量(图9)，含量最低为每公斤鲜重含160.7mg，最高可达242.8mg。  7) and the standard curve, calculate the amount of antibodies in transgenic plants (FIG. 9), minimum content containing 160.7 mg per kilogram fresh weight, up 242.8mg. 1)取50克转基因植物材料，总蛋白的提取同实施例4。  1) 50 g of transgenic plant material, total proteins were extracted in Example 4 of the same embodiment. 2)蛋白粗提液经0.45μπι滤膜过滤。  2) protein crude extracts was 0.45μπι membrane filter. 3)用蛋白结合缓冲液（0.02Μ sodium phosphate buffer，pH 7.0)平衡HiTrap Protein A HP柱。  3) with a protein binding buffer (0.02Μ sodium phosphate buffer, pH 7.0) equilibrium HiTrap Protein A HP column. 4)过滤后的蛋白提取液上柱，并用5倍柱体积的蛋白结合缓冲液洗柱。  4) column after the protein extract was filtered, and the column was washed with binding buffer, 5 column volumes of protein. 5)用洗脱液(0.謂617(^1^-!1(：1，？!12.7)洗脱柱上结合的抗体，并收集于含1/5洗脱体积的1M Tris-HCl(pH 9.0)中，中和到pH值7.0。  5) eluent (0. 617 that (^ 1 ^ --1 (:!?! 1, 12.7) eluting bound antibody column, eluted and collected containing 1/5 volume of 1M Tris in -HCl (pH 9.0), neutralized to a pH of 7.0. 6)收集到的抗体用分子量30kDa的滤膜（分子量，301^&，丨11丨？〇^，1^4)超滤纯化。 Antibodies  6) collected molecular weight 30kDa membrane (molecular weight, 301 & ^, Shu Shu 11? Billion ^, 1 ^ 4) ultrafiltration purification. 7)利用上述实例5中ELI SA方法测定抗体浓度，两个样品中回收到抗体的浓度相当于每克新鲜组织中抗体含量为135.1和101. lyg，回收率分别为55.6%和59.8%。 Determination of antibody concentration ELI SA Method 5  7) using the above-described example, two samples corresponding to the concentration of antibody was recovered per gram of fresh tissue in an amount of 135.1 antibody and 101. lyg, recoveries were 59.8 and 55.6% %. 8)利用上述实例4中非变性SDS-PAGE胶上分离，考马斯亮蓝染色方法检测抗体的质量和纯度。  8) Example 4 using the separated gel Africa denaturing SDS-PAGE, Coomassie blue staining to detect the quality and purity of the antibody. 结果发现绝大部分抗体为约150kDa的四聚体（图10)及少量降解产物。 The results showed that most of the antibody is a tetramer (FIG. 10) of approximately 150kDa and a small amount of degradation products. 纯度大于95%。 Purity greater than 95%. 9)提纯的抗体可用于下面的SPR结合实验及糖基化分析。  9) The purified antibodies can be used the following SPR binding experiments and glycosylation analysis. 1)将hVEGF抗原蛋白结合于GE CM5感应芯片上。  1) The binding to the antigen protein hVEGF GE CM5 sensor chip. 2)以不同浓度将阿瓦斯汀抗体及上述提纯抗体分别同芯片上的抗原结合，检测表面等离子共振情况(图11、12)并计算抗体和抗原的结合和解离系数(表2)。  2) at different concentrations Avastin purified antibodies are antibodies and said antigens on the same chip bonding, surface plasmon resonance detection (FIG. 11) and calculates the antibodies and antigen-binding dissociation coefficient (Table 2) . 3)由表2可以看出，从转基因水稻中提纯的抗体对抗原hVEGF的结合力强于阿瓦斯汀抗体，有可能作为阿瓦斯汀的替代产品用于癌症治疗。  3) It can be seen from Table 2, was purified from transgenic rice hVEGF antibody antigen binding antibody stronger than Avastin, it may be used as cancer therapeutic alternative for Avastin. 1)上述实施例4中提纯的抗体用Trypsin蛋白酶水解成多肽。  1) in Example 4 above purified antibody to the polypeptide Trypsin Hydrolysis. 2)多肽经过毛细管反向层析分离后用quadrupole time-of-f light(Q-TOF) Ultima Global (Waters)质谱仪进行分析。  2) polypeptide analysis of-f time-light (Q-TOF) Ultima Global (Waters) mass spectrometer after separation by capillary reverse phase chromatography quadrupole. 3)利用Peptide Mass program(http : //www. expasy .org/tools/peptide-mass.html)将质谱数据和Trypsin蛋白酶水解的Bevacizumab氨基酸序列比较得出糖基化数据(如表3所示）。  3) using the Peptide Mass program (http:. 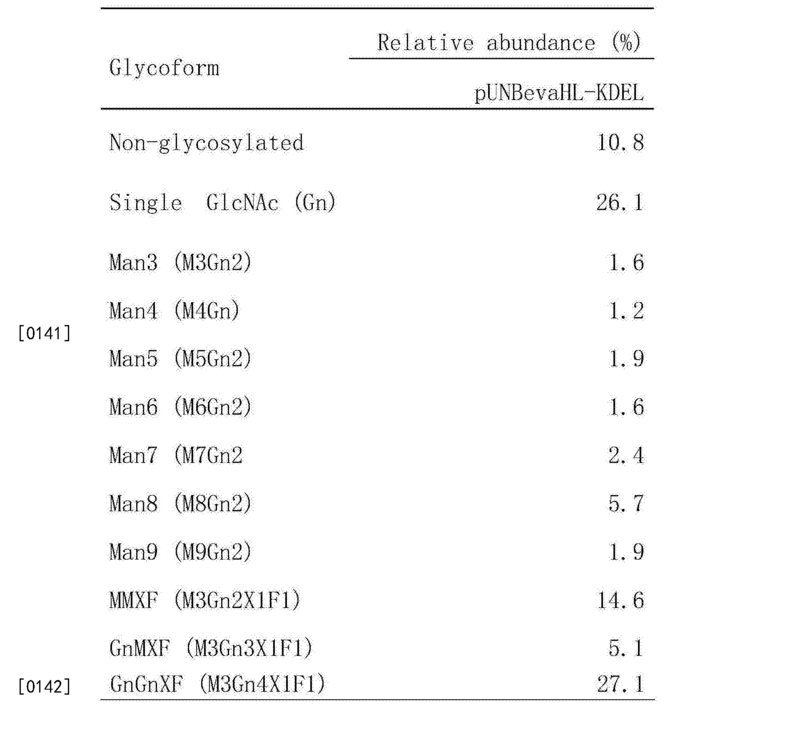 // www expasy .org / tools / peptide-mass.html) mass spectral data and the amino acid sequence of Bevacizumab Trypsin proteolysis glycosylation derived from a comparison of data (e.g., Table 3 shown). 4)由表3可以看出，植物特异性糖基化，包括MMXF(M3Gn2XlFl)，GnMXF(M3Gn3XlFl) 和GnGnXF(M3Gn4XlFl)占总量的46 · 8 %。  4) it can be seen from Table 3, plant-specific glycosylation, including MMXF (M3Gn2XlFl), GnMXF (M3Gn3XlFl) and GnGnXF (M3Gn4XlFl) accounted for 46% of the total 6.8. 1. 一种优化的植物源重组人源化贝伐单克隆抗体的制备方法，其特征在于:包括以下步骤： 步骤1.设计含有2A序列及Furin切点的贝伐单抗重链和轻链融合蛋白，序列依次包含： 1) 抗体重链序列BHC MEFGLSffLFLVAILKGVQCEVQLVESGGGLVQPGGSLRLSCAASGYTFTNYGMNffVRQAPGKGLEffVGffINTY TGEPTYAADFKRRFTFSLDTSKSTAYLQMNSLRAEDTAVYYCAKYPHYYGSSHWYFDVWGQGTLVTVSSASTKGPSV FPLAPSSKSTSGGTAALGCLVKDYFPEPVTVSWNSGALTSGVHTFPAVLQSSGLYSLSSVVTVPSSSLGTQTYICNV NHKPSNTKVDKKVEPKSCDKTHTCPPCPAPELLGGPSVFLFPPKPKDTLMISRTPEVTCVVVDVSHEDPEVKFNWYV DGVEVHNAKTKPREEQYNSTYRVVSVLTVLHQDWLNGKEYKCKVSNKALPAPIEKTISKAKGQPREPQVYTLPPSRE EMTKNQVSLTCLVKGFYPSDIAVEWESNGQPENNYKTTPPVLDSDGSFFLYSKLTVDKSRWQQGNVFSCSVMHEALH NHYTQKSLSLSPGK(SEQ ID N0:1) 2) 重链内质网保留序列(KDEL)(SEQ ID N0:2) 3. Furin蛋白酶切割位点（RRKR)(SEQ ID N0:3) 4) 连接肽(656) 5) 2A序列（QLLNFDLLKLAGDVESNPGP)(SEQ ID N0:4) 6) 抗体轻链序列BLC MKYLLPTAAAGLLLLAAQPAMADIQMTQSPSSLSASVGDRVTITCSASQDISNYLNWY The method of preparing a monoclonal antibody bevacizumab 1. A method of optimizing plant derived recombinant humanized, characterized by: comprising the following steps: 1. Design bevacizumab containing heavy and light chain sequences 2A and tangent point Furin fusion protein sequence comprising successively: a) an antibody heavy chain sequence BHC MEFGLSffLFLVAILKGVQCEVQLVESGGGLVQPGGSLRLSCAASGYTFTNYGMNffVRQAPGKGLEffVGffINTY TGEPTYAADFKRRFTFSLDTSKSTAYLQMNSLRAEDTAVYYCAKYPHYYGSSHWYFDVWGQGTLVTVSSASTKGPSV FPLAPSSKSTSGGTAALGCLVKDYFPEPVTVSWNSGALTSGVHTFPAVLQSSGLYSLSSVVTVPSSSLGTQTYICNV NHKPSNTKVDKKVEPKSCDKTHTCPPCPAPELLGGPSVFLFPPKPKDTLMISRTPEVTCVVVDVSHEDPEVKFNWYV DGVEVHNAKTKPREEQYNSTYRVVSVLTVLHQDWLNGKEYKCKVSNKALPAPIEKTISKAKGQPREPQVYTLPPSRE EMTKNQVSLTCLVKGFYPSDIAVEWESNGQPENNYKTTPPVLDSDGSFFLYSKLTVDKSRWQQGNVFSCSVMHEALH NHYTQKSLSLSPGK (SEQ ID N0: 1) 2) heavy chain endoplasmic reticulum retention sequence (KDEL) (SEQ ID N0: 2) 3. Furin protease cleavage site (RRKR) (SEQ ID N0: 3) 4) connecting peptide (656) 5) 2A sequence (QLLNFDLLKLAGDVESNPGP) (SEQ ID N0: 4) 6) an antibody light chain sequence BLC MKYLLPTAAAGLLLLAAQPAMADIQMTQSPSSLSASVGDRVTITCSASQDISNYLNWY QQKPGKAPKVLIYFT SSLHSGVPSRFSGSGSGTDFTLTISSLQPEDFATYYCQQYSTVPWTFGQGTKVEIKRTVAAPSVFIFPPSDEQLKSG TASVVCLLNNFYPREAKVQWKVDNALQSGNSQESVTEQDSKDSTYSLSSTLTLSKADYEKHKVYACEVTHQGLSSPV TKSFNRGEC(SEQ ID NO:5) 7) 轻链内质网保留序列(KDEL) 步骤2.以水稻密码子优化并合成上述融合蛋白基因； 步骤3.构建贝伐单抗植物双元表达载体； 步骤4.采用农杆菌介导法将抗体基因导入水稻愈伤组织细胞并通过潮霉素筛选获得遗传转化水稻植株； 步骤5.采用Southern Blot以及Western Blot方法检测贝伐单抗在水稻中的表达； 步骤6.通过酶联免疫(ELISA)检测水稻中抗体的活性和含量； 步骤7.通过ProteinA亲和柱分离纯化抗体； 步骤8.通过SPR检测抗体对抗原的结合力； 步骤9.通过蛋白酶水解及质谱分析仪分析贝伐单克隆抗体糖基化;得到合乎标准的贝伐单克隆抗体。 QQKPGKAPKVLIYFT SSLHSGVPSRFSGSGSGTDFTLTISSLQPEDFATYYCQQYSTVPWTFGQGTKVEIKRTVAAPSVFIFPPSDEQLKSG TASVVCLLNNFYPREAKVQWKVDNALQSGNSQESVTEQDSKDSTYSLSSTLTLSKADYEKHKVYACEVTHQGLSSPV TKSFNRGEC (SEQ ID NO: 5) 7) a light chain endoplasmic reticulum retention sequence (KDEL) Step 2. Synthesis of rice and the above-described codon-optimized fusion protein gene; Step 3. Construction of the binary plant expression bevacizumab carrier; step 4. the use of Agrobacterium-mediated transformation into rice callus cells and the antibody gene by genetic transformation hygromycin rice plants obtained; step 5 using Southern Blot and Western Blot detected in rice bevacizumab expression; step 6. rice detected by enzyme-linked immunosorbent antibody (ELISA) and activity contents; ProteinA through step 7. purification antibody affinity column; step 8. binding force by SPR detection antibody to the antigen; step 9. by proteolysis and mass spectrometry analysis of the monoclonal antibody bevacizumab glycosylation; obtained up to standard monoclonal antibody bevacizumab. 2. 根据权利要求1所述的一种优化的植物源重组人源化贝伐单克隆抗体的制备方法， 其特征在于：所述步骤1中确定Furin蛋白酶切割位点为RXXR(SEQ IDN0:6)、RX(R/K)R(SEQ ID NO:7)或RRKR(SEQ ID NO:8)，其中R为精氨酸，X为任何氨基酸，K为赖氨酸，其抗体融合蛋白序列表为： MEFGLSffLFLVAILKGVQCEVQLVESGGGLVQPGGSLRLSCAASGYTFTNYGMNffVRQAPGKGLEffVGffINTY TGEPTYAADFKRRFTFSLDTSKSTAYLQMNSLRAEDTAVYYCAKYPHYYGSSHWYFDVWGQGTLVTVSSASTKGPSV FPLAPSSKSTSGGTAALGCLVKDYFPEPVTVSWNSGALTSGVHTFPAVLQSSGLYSLSSVVTVPSSSLGTQTYICNV NHKPSNTKVDKKVEPKSCDKTHTCPPCPAPELLGGPSVFLFPPKPKDTLMISRTPEVTCVVVDVSHEDPEVKFNWYV DGVEVHNAKTKPREEQYNSTYRVVSVLTVLHQDWLNGKEYKCKVSNKALPAPIEKTISKAKGQPREPQVYTLPPSRE EMTKNQVSLTCLVKGFYPSDIAVEWESNGQPENNYKTTPPVLDSDGSFFLYSKLTVDKSRWQQGNVFSCSVMHEALH NHYTQKSLSLSPGKKDELRRKRGSGQLLNFDLLKLAGDVESNPGPMKYLLPTAAAGLLLLAAQPAMADIQMTQSPSS LSASVGDRVTITCSASQDISNYLNWYQQKPGKAPKVLIYFTSSLHSGVPSRFSGSGSGTDFTLTISSLQPEDFATYY CQQYSTVPWTFGQGTKVEIKRTVAAPSVFIFPPSDEQ The one of the optimization of a plant-derived recombinant human bevacizumab claim preparing humanized monoclonal antibody, wherein: said step of determining a protease Furin cleavage site RXXR (SEQ IDN0: 6 ), RX (R / K) R (SEQ ID nO: 7) or a RRKR (SEQ ID nO: 8), wherein R is arginine, X is any amino acid, K is lysine, which is an antibody fusion protein sequence listing is: MEFGLSffLFLVAILKGVQCEVQLVESGGGLVQPGGSLRLSCAASGYTFTNYGMNffVRQAPGKGLEffVGffINTY TGEPTYAADFKRRFTFSLDTSKSTAYLQMNSLRAEDTAVYYCAKYPHYYGSSHWYFDVWGQGTLVTVSSASTKGPSV FPLAPSSKSTSGGTAALGCLVKDYFPEPVTVSWNSGALTSGVHTFPAVLQSSGLYSLSSVVTVPSSSLGTQTYICNV NHKPSNTKVDKKVEPKSCDKTHTCPPCPAPELLGGPSVFLFPPKPKDTLMISRTPEVTCVVVDVSHEDPEVKFNWYV DGVEVHNAKTKPREEQYNSTYRVVSVLTVLHQDWLNGKEYKCKVSNKALPAPIEKTISKAKGQPREPQVYTLPPSRE EMTKNQVSLTCLVKGFYPSDIAVEWESNGQPENNYKTTPPVLDSDGSFFLYSKLTVDKSRWQQGNVFSCSVMHEALH NHYTQKSLSLSPGKKDELRRKRGSGQLLNFDLLKLAGDVESNPGPMKYLLPTAAAGLLLLAAQPAMADIQMTQSPSS LSASVGDRVTITCSASQDISNYLNWYQQKPGKAPKVLIYFTSSLHSGVPSRFSGSGSGTDFTLTISSLQPEDFATYY CQQYSTVPWTFGQGTKVEIKRTVAAPSVFIFPPSDEQ LKSGTASVVCLLNNFYPREAKVQWKVDNALQSGNSQESVT EQDSKDSTYSLSSTLTLSKADYEKHKVYACEVTHQGLSSPVTKSFNRGECKDEL*(SEQ ID N0:9)； 所述抗体融合蛋白基因核酸序列（SEQ ID NO: 10)为： TTAATTAA(Pac頂每切位点）ATG(蛋白质翻译起始）GAG TTC GGT CTC TCA TGG CTT TTT TTG GTT GCA ATT CTC AAA GGG GTT CAG TGC GAG GTG CAG TTG GTT GAA TCT GGT GGG GGG CTC GTT CAA CCG GGC GGG TCA CTT AGG CTC TCG TGT GCG GCT TCG GGA TAC ACG TTT ACG AAC TAC GGA ATG AAT TGG GTG AGG CAA GCA CCC GGA AAG GGC CTT GAG TGG GTT GGG TGG ATC AAT ACG TAC ACG GGT GAA CCT ACC TAC GCT GCT GAC TTT AAG AGA AGA TTT ACA TTC AGC CTG GAC ACA AGC AAG AGC ACC GCA TAT CTT CAG ATG AAC AGC CTT AGG GCT GAA GAT ACC GCG GTG TAC TAC TGC GCT AAA TAC CCT CAC TAC TAC GGG TCA AGT CAT TGG TAT TTC GAC GTT TGG GGG CAA GGG ACA TTG GTC ACA GTC TCT TCA GCT AGT ACT AAG GGA CCA TCC GTC TTT CCC CTG GCT CCA AGC AGT AAA AGC ACT AGC GGA GGG ACA GCG GCT TTG GGT TGT TTG GTC AAG GAT TAC TTT CCC GAA CCA GTC ACT GTG TCC TGG AAT TCG GGA GCT CTT ACC TCC GGG GTC LKSGTASVVCLLNNFYPREAKVQWKVDNALQSGNSQESVT EQDSKDSTYSLSSTLTLSKADYEKHKVYACEVTHQGLSSPVTKSFNRGECKDEL ​​* (SEQ ID N0: 9); the nucleic acid sequence of the antibody fusion protein gene (SEQ ID NO: 10) is: TTAATTAA (Pac top of each cleavage site) the ATG (translation initiation protein) GAG TTC GGT CTC TCA TGG CTT TTT TTG GTT GCA ATT CTC AAA GGG GTT CAG TGC GAG GTG CAG TTG GTT GAA TCT GGT GGG GGG CTC GTT CAA CCG GGC GGG TCA CTT AGG CTC TCG TGT GCG GCT TCG GGA TAC ACG TTT ACG AAC TAC GGA ATG AAT TGG GTG AGG CAA GCA CCC GGA AAG GGC CTT GAG TGG GTT GGG TGG ATC AAT ACG TAC ACG GGT GAA CCT ACC TAC GCT GCT GAC TTT AAG AGA AGA TTT ACA TTC AGC CTG GAC ACA AGC AAG AGC ACC GCA TAT CTT CAG ATG AAC AGC CTT AGG GCT GAA GAT ACC GCG GTG TAC TAC TGC GCT AAA TAC CCT CAC TAC TAC GGG TCA AGT CAT TGG TAT TTC GAC GTT TGG GGG CAA GGG ACA TTG GTC ACA GTC TCT TCA GCT AGT ACT AAG GGA CCA TCC GTC TTT CCC CTG GCT CCA AGC AGT AAA AGC ACT AGC GGA GGG ACA GCG GCT TTG GGT TGT TTG GTC AAG GAT TAC TTT CCC GAA CCA GTC ACT GTG TCC TGG AAT TCG GGA GCT CTT ACC TCC GGG GTC CAC ACG TTC CCC GCC GTG CTG CAG AGC TCG GGG CTG TAC TCG CTG TCC TCC GTC GTC ACA GTT CCA TCG TCC TCG CTT GGA ACG CAG ACC TAT ATA TGC AAC GTT AAC CAT AAA CCT TCT AAC ACC AAA GTG GAT AAA AAA GTG GAG CCA AAA TCA TGT GAT AAA ACT CAT ACC TGC CCA CCT TGT CCA GCC CCG GAA TTG TTG GGT GGG CCG TCT GTT TTT CTG TTT CCC CCA AAA CCG AAG GAT ACA CTT ATG ATC TCC CGG ACG CCG GAG GTT ACG TGC GTT GTC GTT GAT GTG AGT CAT GAA GAC CCG GAG GTG AAA TTT AAC TGG TAC GTC GAT GGT GTC GAG GTC CAT AAC GCA AAA ACA AAG CCC CGC GAG GAA CAA TAC AAC TCG ACC TAC CGG GTC GTC AGC GTG CTG ACG GTC CTG CAC CAA GAT TGG CTC AAT GGA AAA GAA TAC AAG TGC AAG GTG AGC AAC AAA GCA CTG CCC GCG CCA ATC GAA AAG ACT ATC TCC AAA GCG AAA GGT CAG CCG AGG GAA CCC CAA GTG TAC ACC CTG CCG CCT AGT CGC GAG GAG ATG ACC AAG AAC CAG GTC AGT CTT ACG TGC CTG GTG AAG GGA TTT TAT CCA TCT GAT ATC GCA GTC GAG TGG GAA TCC AAT GGC CAG CCA GAA AAC AAT TAT AAG ACT ACC CCA CCT GTT CTC GAT AGC GAT GGC TCG TTT TTC CTG TAC AGC AAA CTG ACT GTC GAT AAAAAA GAC GAG CAC ACG TTC CCC GCC GTG CTG CAG AGC TCG GGG CTG TAC TCG CTG TCC TCC GTC GTC ACA GTT CCA TCG TCC TCG CTT GGA ACG CAG ACC TAT ATA TGC AAC GTT AAC CAT AAA CCT TCT AAC ACC AAA GTG GAT AAA AAA GTG GAG CCA AAA TCA TGT GAT AAA ACT CAT ACC TGC CCA CCT TGT CCA GCC CCG GAA TTG TTG GGT GGG CCG TCT GTT TTT CTG TTT CCC CCA AAA CCG AAG GAT ACA CTT ATG ATC TCC CGG ACG CCG GAG GTT ACG TGC GTT GTC GTT GAT GTG AGT CAT GAA GAC CCG GAG GTG AAA TTT AAC TGG TAC GTC GAT GGT GTC GAG GTC CAT AAC GCA AAA ACA AAG CCC CGC GAG GAA CAA TAC AAC TCG ACC TAC CGG GTC GTC AGC GTG CTG ACG GTC CTG CAC CAA GAT TGG CTC AAT GGA AAA GAA TAC AAG TGC AAG GTG AGC AAC AAA GCA CTG CCC GCG CCA ATC GAA AAG ACT ATC TCC AAA GCG AAA GGT CAG CCG AGG GAA CCC CAA GTG TAC ACC CTG CCG CCT AGT CGC GAG GAG ATG ACC AAG AAC CAG GTC AGT CTT ACG TGC CTG GTG AAG GGA TTT TAT CCA TCT GAT ATC GCA GTC GAG TGG GAA TCC AAT GGC CAG CCA GAA AAC AAT TAT AAG ACT ACC CCA CCT GTT CTC GAT AGC GAT GGC TCG TTT TTC CTG TAC AGC AAA CTG ACT GTC GAT AAAAAA GAC GAG CTC AGT AGG TGG CAA CAA GGC AAC GTG TTC TCT TGC TCG GTG ATG CAC GAA GCA CTC CAC AAC CAT TAC ACC CAG AAG TCA TTG TCC CTG TCA CCC GGG AAG CGC CGC AAA AGG GGT AGC GGA CAG CTT CTT AAC TTC GAT CTG TTG AAG CTT GCT GGA GAC GTC GAA AGT AAC CCT GGA CCA ATG AAG TAT TTG CTT CCG ACA GCA GCG GCG GGG TTG TTG CTT CTC GCC GCG CAA CCG GCT ATG GCC GAC ATA CAG ATG ACT CAG AGC CCA TCA TCG CTG AGT GCG TCC GTT GGT GAT CGC GTC ACA ATT ACT TGC TCA GCA AGT CAG GAT ATT TCA AAT TAT TTG AAC TGG TAC CAA CAG AAG CCG GGA AAG GCT CCT AAA GTT CTC ATC TAC TTC ACT AGT AGC TTG CAC AGC GGG GTC CCA TCC AGA TTC TCG GGC TCC GGG TCC GGC ACC GAT TTC ACG CTC ACC ATT TCA TCC CTT CAG CCC GAA GAC TTT GCC ACG TAT TAT TGT CAA CAA TAT TCT ACT GTG CCA TGG ACA TTT GGA CAG GGT ACC AAA GTC GAG ATT AAA AGA ACA GTT GCC GCA CCA TCA GTG TTT ATT TTT CCA CCA TCG GAC GAG CAA CTC AAA TCG GGT ACT GCC AGC GTC GTG TGC TTG CTT AAC AAC TTT TAC CCC AGA GAA GCA AAG GTT CAG TGG AAA GTT GAT AAT GCC CTC CAG TCG GGA AAC TCT CAA GAA TCC GTG ACC GAA CAA GAT CTC AGT AGG TGG CAA CAA GGC AAC GTG TTC TCT TGC TCG GTG ATG CAC GAA GCA CTC CAC AAC CAT TAC ACC CAG AAG TCA TTG TCC CTG TCA CCC GGG AAG CGC CGC AAA AGG GGT AGC GGA CAG CTT CTT AAC TTC GAT CTG TTG AAG CTT GCT GGA GAC GTC GAA AGT AAC CCT GGA CCA ATG AAG TAT TTG CTT CCG ACA GCA GCG GCG GGG TTG TTG CTT CTC GCC GCG CAA CCG GCT ATG GCC GAC ATA CAG ATG ACT CAG AGC CCA TCA TCG CTG AGT GCG TCC GTT GGT GAT CGC GTC ACA ATT ACT TGC TCA GCA AGT CAG GAT ATT TCA AAT TAT TTG AAC TGG TAC CAA CAG AAG CCG GGA AAG GCT CCT AAA GTT CTC ATC TAC TTC ACT AGT AGC TTG CAC AGC GGG GTC CCA TCC AGA TTC TCG GGC TCC GGG TCC GGC ACC GAT TTC ACG CTC ACC ATT TCA TCC CTT CAG CCC GAA GAC TTT GCC ACG TAT TAT TGT CAA CAA TAT TCT ACT GTG CCA TGG ACA TTT GGA CAG GGT ACC AAA GTC GAG ATT AAA AGA ACA GTT GCC GCA CCA TCA GTG TTT ATT TTT CCA CCA TCG GAC GAG CAA CTC AAA TCG GGT ACT GCC AGC GTC GTG TGC TTG CTT AAC AAC TTT TAC CCC AGA GAA GCA AAG GTT CAG TGG AAA GTT GAT AAT GCC CTC CAG TCG GGA AAC TCT CAA GAA TCC GTG ACC GAA CAA GAT AGC AAA GAT TCT ACA TAT TCC CTT AGT TCA ACA CTC ACA CTG TCA AAA GCA GAC TAC GAA AAG CAT AAG GTT TAT GCA TGT GAA GTT ACG CAC CAG GGT TTG TCC TCT CCA GTC ACG AAG AGT TTC AAC CGC GGG GAG TGT AAA GAC GAG CTC TAA(蛋白质翻译终止)ACGCGT (Mlu頂每切位点），其中包含5'PacI(TTAATTAA)和3'Mlul(ACGCGT)限制性内切酶位点。 AGC AAA GAT TCT ACA TAT TCC CTT AGT TCA ACA CTC ACA CTG TCA AAA GCA GAC TAC GAA AAG CAT AAG GTT TAT GCA TGT GAA GTT ACG CAC CAG GGT TTG TCC TCT CCA GTC ACG AAG AGT TTC AAC CGC GGG GAG TGT AAA GAC GAG CTC TAA (termination of protein translation) ACGCGT (Mlu top of each cleavage site), which comprises 5'PacI (TTAATTAA) and 3'Mlul (ACGCGT) restriction enzyme sites. 3. 根据权利要求1所述的一种优化的植物源重组人源化贝伐单克隆抗体的制备方法， 其特征在于:所述步骤3构建贝伐单抗植物双元表达载体，是将融合蛋白基因DNA片段通过PacI和Mlul限制性内切酶位点插入到双元载体pUN1390上的基因表达框，该基因位于玉米ubiquitin启动子的后面，及Nos终止子的前面；以上所述的酶切位点，也可以是任何限制性内切酶位点，通过基因合成，PCR引物，或连接序列插入到重组基因片段的两端，以便将重组基因插入到相应的位点；上述启动子可以是任何有利于基因表达的启动子，如上述玉米泛素(111^911；[1:;[11)启动子，水稻4〇1:;[11启动子，花椰菜花叶病毒(〇31\〇353启动子，农杆菌1'1〇8启动子等组成性启动子;组织特异性启动子，如在水稻胚乳中特异性表达的Gtl，GluA，GluB启动子;诱导性启动子，如水稻干旱诱导启动子0shox24P，雌二 3. An optimized method for preparing the humanized monoclonal antibody bevacizumab plant derived recombinant human according to claim 1, wherein: said step of constructing 3 bevacizumab binary plant expression vector, the fusion is protein gene DNA fragment PacI cut through the inner and Mlul restriction enzyme sites into a gene expression cassette inserted in the binary vector pUN1390, the gene is located behind the maize ubiquitin promoter and Nos terminator front promoter; the above-digested site may be any enzyme restriction sites, by gene synthesis, the PCR primer sequence is inserted or attached to both ends of a recombinant gene fragments, so that the recombinant gene is inserted into the corresponding sites; and the promoter may be any promoter facilitate gene expression, as described in the maize ubiquitin (111 ^ 911; [1:; [11) promoter, rice 4〇1:; [11 promoter, cauliflower mosaic virus (〇31 \ 〇353 promoters, Agrobacterium promoters, etc. 1'1〇8 constitutive promoter; tissue-specific promoters, such as of Gtl specifically expressed in rice endosperm, GluA, GluB promoter; inducible promoters, drought-inducible such as rice promoter 0shox24P, estradiol 诱导表达启动子XVE;上述终止子是指任何能够使得基因转录终止的DNA序列，如上述Nos终止子以及T35终止子。 XVE inducible expression promoters; refers to any of the above-described terminator DNA sequence of a gene can cause transcription termination, as described above, and Nos terminator T35 terminator. 4. 根据权利要求1所述的一种优化的植物源重组人源化贝伐单克隆抗体的制备方法， 其特征在于:所述步骤4采用基因枪、农杆菌或其他基因转化法将抗体基因导入水稻愈伤组织细胞并通过潮霉素筛选获得遗传转化水稻植株，其具体步骤如下： 1) 水稻愈伤组织的诱导：将成熟的日本晴种子去壳，用75%的酒精消毒30秒，再用5% 次氯酸钠溶液消毒25分钟，无菌水漂洗3~5次，置无菌纸上，在超净工作台上吹干，接种于N6D2愈伤组织诱导培养基上，每个培养皿接种12~15粒，于28 °C暗培养4周，期间切除胚根， 每两周继代一次； 2) 根癌农杆菌的活化：1)将转化了贝伐单抗质粒的农杆菌(EHA105)接种在含有50mg/L 的卡纳霉素和50mg/L利氟平的LB液体培养基中，28°C，转速200转每分钟振荡培养18小时； 2)取lml培养好的农杆菌放在2ml灭菌的离心管中，转速6000转每分钟，离心5分钟收 The method for preparing a monoclonal antibody bevacizumab claim 1 plant derived optimized recombinant humanized claim, wherein: said step of using a gene gun 4, Agrobacterium transformation or other genes antibody genes into rice callus cells and hygromycin obtained by genetic transformation of rice plants, the specific steps are as follows: 1) rice callus: mature seeds of Nipponbare shelled, disinfected with 75% alcohol for 30 seconds, and then sterilized with 5% sodium hypochlorite solution for 25 minutes, rinsed with sterile water 3 to 5 times, the sterile paper is set, the dry clean table, N6D2 plated on callus induction medium, each dish was inoculated 12 ~ 15, dark at 28 ° C for 4 weeks, during removal of the radicle, once every two weeks subculture; 2) activation of the Agrobacterium tumefaciens: 1) converting bevacizumab plasmid of Agrobacterium (EHA105) was inoculated LB liquid medium containing 50mg / L of kanamycin and 50mg / L of Li-fluoro-flat, 28 ° C, shaking speed of 200 revolutions per minute, 18 hours; 2) lml take off 2ml culture well in Agrobacterium bacteria in tubes, 6000 rpm per minute, centrifuged for 5 minutes yield 集菌体，用200μ1的AAM液体培养基重悬菌体，取10μ1菌液接种到50ml含有200μΜ AS(乙酰丁香酮)的AAM液体培养基中，28°C，转速160转每分钟振荡培养2小时，以备转化之用； 3) 农杆菌转化水稻胚性愈伤组织：1)浸染，选取直径为3~5mm的结构致密的愈伤组织颗粒，在制备好的AAM菌液中浸染10min;4)共培养，将浸染后的愈伤组织放在无菌滤纸上吸去组织表面的菌液，转接至共培养基N6D2-CO上，26°C暗培养3天;3)选择培养，将共培养3天的愈伤组织用含有0.01%吐温的无菌水漂洗5次，然后在含500mg/L头孢霉素的无菌水中漂洗10分钟，将愈伤组织放置无菌滤纸上，在超净工作台上晾干愈伤组织上的水，再转接至选择培养基N6D-Se上，28°C暗培养四周；4)分化培养，将抗性愈伤组织转接至分化培养基MS-Re上，16小时光照，8小时黑暗，28 °C培养至分化出绿苗;将小苗转接至用灭菌瓶装的生 AAM broth set cells, with a liquid medium 200μ1 AAM resuspended cells, bacteria were inoculated into 50ml take 10μ1 containing 200μΜ AS (acetosyringone) of, 28 ° C, shaking speed of 160 revolutions per minute 2 hours, to prepare the conversion purposes; 3) Agrobacterium transformation of rice embryogenic callus: 1) disseminated select a dense structure having a diameter of 3 ~ 5mm particles of callus, disseminated in 10min AAM prepared bacteria liquid; 4) co-cultivation, callus tissue was placed on sterile filter paper disseminated tissue surface to absorb bacteria, to co-transfer medium on N6D2-cO, 26 ° C dark for 3 days; 3) selective culture, the co-cultured for 3 days calli containing 0.01% Tween rinsed five times with sterile water, and then rinsed in sterile water containing 500mg / L cefotaxime for 10 minutes, the callus is placed on sterile filter paper, drying the water calli clean table, and then transfer onto selection medium N6D-Se, 28 ° C dark culture for four weeks; 4) differentiation culture, callus resistant to the adapter differentiation culture based on MS-Re, 16 h light, 8 h dark, 28 ° C to culture differentiated plantlet; seedlings forwarded to the green bottle with sterilized 根培养基MS-Hf上，培养2周后，洗净小苗根上的培养基转到水中培养3天，然后移栽到大田。 After the root medium on MS-Hf, cultured for 2 weeks, the cleaning medium plantlets to root in water for 3 days, and then transplanted to the field. 5. 根据权利要求4所述的一种优化的植物源重组人源化贝伐单克隆抗体的制备方法， 其特征在于:所述的水稻组织培养所需培养基为： N6D2培养基：3 · 9g/L Chus N6(Chu，1975) (CHP01-50LT，10402809，Caisson，USA)，N6维生素，（2mg/L甘氨酸，0 · 5mg/L烟酸，1 .Omg/L维生素B1，0 · 5mg/L维生素B6)，0 · lg/L肌醇， 1. Og/L水解酪蛋白，0.5g/lJt氨酸，0.5g//L谷氨酰胺，2mg/L 2，4-二氯苯氧乙酸（2，4-D)， 30g/L蔗糖，1M K0H调节pH5 · 8，3 · Og/L植物凝胶，121°C，220KPa，灭菌20分钟； N6D2-Co培养基:N6D2中加入lOg/1葡萄糖，1M KOH调节pH5·5，3·Og/L植物凝胶，121°C， 220即3，灭菌10分钟，待培养基冷却到50<€，加入200碰的乙酰丁香酮（4〇61:〇85^;[1^〇116， AS); N6D2-Se培养基:N6D2培养基冷却到50°(：，121°(：，22(^^，灭菌20分钟，加入5〇11^/1潮霉素B和500mg/L头孢霉素； MS-Re培养基：4 ·6g/L MS(M10400-50 ·0，P06968 The optimization according to a 4-plant derived recombinant human bevacizumab claim preparing humanized monoclonal antibody, wherein: the rice tissue culture medium as required: N6D2 medium: 3.1 9g / L Chus N6 (Chu, 1975) (CHP01-50LT, 10402809, Caisson, USA), N6 vitamins, (2mg / L glycine, · 5mg 0 · 5mg / L nicotinic acid, 1 .Omg / L vitamin B1,0 / L vitamin B6), 0 · lg / L myo-inositol, 1. Og / L casein hydrolyzate, 0.5g / lJt acid, 0.5g // L-glutamine, 2mg / L 2,4- dichlorophenoxyacetic acid (2,4-D), 30g / L sucrose, 1M K0H adjusting pH5 · 8,3 · Og / L phytagel, 121 ° C, 220KPa, sterilized 20 minutes; N6D2-Co media: N6D2 was added lOg / 1 glucose, 1M KOH adjusted pH5 · 5,3 · Og / L phytagel, 121 ° C, 220 i.e. 3, sterilized for 10 minutes, the medium to be cooled to 50 <€, touch added 200 acetosyringone (4〇61: 〇85 ^; [1 ^ 〇116, AS); N6D2-Se medium: N6D2 medium was cooled to 50 ° (:, 121 ° (:, 22 (^^, sterilized for 20 minutes, 5〇11 ^ / 1 hygromycin B and 500mg / L cefotaxime; MS-Re medium: 4 · 6g / L MS (M10400-50 · 0, P06968 rpi，USA)，2 ·Omg/L 6-苄氨基腺嘌呤(6-BA)，0·5mg/L萘乙酸(NAA)，1 ·Omg/L激动素(KT)，30g/L蔗糖，30g/L山梨醇，1M KOH调节pH5 · 8，3 · Og/L Gelrite，121°C，220KPa，灭菌20分钟，冷却到50°C，加入50mg/L潮霉素B和500mg/L头孢霉素； MS-HF 培养基：2.3g/L MS(M10400-50.0，P06968，rpi，USA)，30g/L 蔗糖，1M KOH 调pH5 · 8，3 · Og/L Gelrite，121°C，220KPa，灭菌20分钟，冷却到50°C，加入50mg/L潮霉素B; AAM培养基:0.5g//L水解酪蛋白，68.5g/L蔗糖，36g/L葡萄糖，0.9g//L谷氨酰胺，0.3g/L 天冬氨酸，3g/L氯化钾，10mg/L五水硫酸猛，3 · 0mg/L硼酸，2 · 0mg/L七水硫酸锌，0 · 25mg/L二水钼酸纳，〇. 〇25mg/L五水硫酸铜，0.025mg/L六水氯化钴，0.75mg/li典化钾，ISmg/l二水氯化钙，25mg/L七水硫酸镁，4mg/L乙二胺四乙酸(EDTA)，15mg/L二水磷酸二氢钠，lmg/L烟酸， lmg/L维生素B6，10mg/L维生素Bl，100mg/L肌醇，176mg/L精氨酸，75mg/L甘氨酸 rpi, USA), 2 · Omg / L 6- benzylamino adenine (6-BA), 0 · 5mg / L naphthalene acetic acid (NAA), 1 · Omg / L kinetin (KT), 30g / L sucrose, 30g / L sorbitol, 1M KOH adjusted pH5 · 8,3 · Og / L Gelrite, 121 ° C, 220KPa, sterilized for 20 min, cooled to 50 ° C, was added 50mg / L hygromycin B and 500mg / L Cephalosporium Su; MS-HF medium: 2.3g / L MS (M10400-50.0, P06968, rpi, USA), 30g / L sucrose, 1M KOH tone pH5 · 8,3 · Og / L Gelrite, 121 ° C, 220KPa, sterilized for 20 min, cooled to 50 ° C, was added 50mg / L hygromycin B; AAM medium: 0.5g // L casein hydrolyzate, 68.5g / L sucrose, 36g / L glucose, 0.9g // L Valley amide, 0.3g / L aspartic acid, 3g / L potassium chloride, 10mg / L Meng sulfate pentahydrate, 3 · 0mg / L of boric acid, 2 · 0mg / L of zinc sulfate heptahydrate, 0 · 25mg / L two water, sodium molybdate, square. 〇25mg / L copper sulfate pentahydrate, 0.025mg / L cobalt chloride hexahydrate, 0.75mg / li Code potassium, ISmg / l calcium chloride dihydrate, 25mg / L magnesium sulfate heptahydrate , 4mg / L ethylenediaminetetraacetic acid (EDTA), 15mg / L sodium dihydrogen phosphate dihydrate, lmg / L nicotinic acid, lmg / L vitamin B6,10mg / L vitamin Bl, 100mg / L myo-inositol, 176mg / L arginine, 75mg / L glycine 1M K0H调节pH到5.2，0.22uM滤膜过滤除菌。 The pH was adjusted to 1M K0H 5.2,0.22uM filter to sterilize. 8. 根据权利要求1所述的一种优化的植物源重组人源化贝伐单克隆抗体的制备方法， 其特征在于：采用该制备方法制备并提纯的贝伐单克隆抗体为四聚体，其分子量为140-160kDa，纯度大于95%。 1 according to one of the optimization of plant-derived recombinant human bevacizumab claim preparing humanized monoclonal antibodies, comprising: preparing and purified monoclonal antibody bevacizumab tetramer using this production method, a molecular weight of 140-160kDa, greater than 95% purity. 9. 根据权利要求1所述的一种优化的植物源重组人源化贝伐单克隆抗体的制备方法， 其特征在于：所述贝伐单克隆抗体的植物特异性糖基化，包括MMXF(M3Gn2XlFl)，GnMXF (M3Gn3XlFl)和GnGnXF(M3Gn4XlFl)，占糖基化抗体总量的46 · 8%。 1 according to one of the plant-derived recombinant human optimization method for preparing the humanized monoclonal antibody bevacizumab claim, wherein: the plant-specific glycosylation bevacizumab, a monoclonal antibody, comprising MMXF ( M3Gn2XlFl), GnMXF (M3Gn3XlFl) and GnGnXF (M3Gn4XlFl), accounting for 10.8 glycosylated 46% of the total antibody. 10. -种贝伐单克隆抗体药物，其特征在于：由权利要求1--9所述的一种优化的植物源重组人源化贝伐单克隆抗体的制备方法制得的贝伐单克隆抗体与常用药物载体制备得到的生物药物;该药物可取代商品药物阿瓦斯汀，应用于人体源;该药物用于治疗乳腺癌，肺癌、恶性胶质瘤、肾癌、子宫颈癌、卵巢癌、结肠癌以及直肠癌。 10. - monoclonal antibody drug species bevacizumab, characterized in that: an optimized plant derived recombinant human claims 1--9 said resulting humanized monoclonal bevacizumab Avastin monoclonal antibody preparation method conventional pharmaceutical carrier and an antibody preparation obtained biopharmaceutical; the drug Avastin substitutable pharmaceutical product, the body is applied to the source; medicament for the treatment of breast cancer, lung cancer, malignant glioma, renal cancer, cervical cancer, ovarian cancer , colon cancer and colorectal cancer.